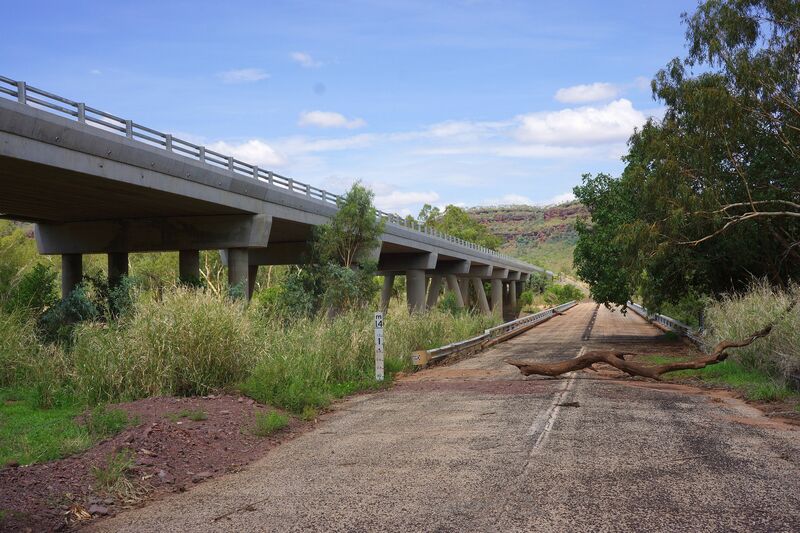 The route out of Kununurra runs between two rugged escarpments that define the boundaries of the Victoria River flood plain. If these escarpments were closer together, you would probably call them a “gorge” but the spectacular cliffs diverge as you head east and the highway runs along the flat flood plain. 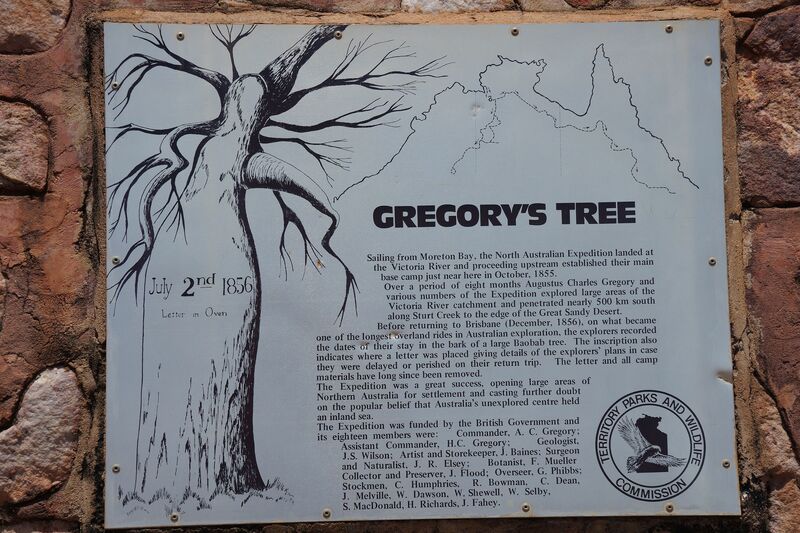 We stopped to see the Gregory’s Tree, a Boab tree near where the explorer Augustus Gregory camped with his party on 2nd. July, 1856. They marked up the tree with some graffiti and left a letter detailing their discoveries in an “oven”, just in case they never made it back. We would have taken a looksee but it required several kilometers of driving on an unsealed road. Not today. We passed trees with roosting black cockatoos and our first “Crocodile Warning” sign, reminding us that the Victoria river is not for swimmers. 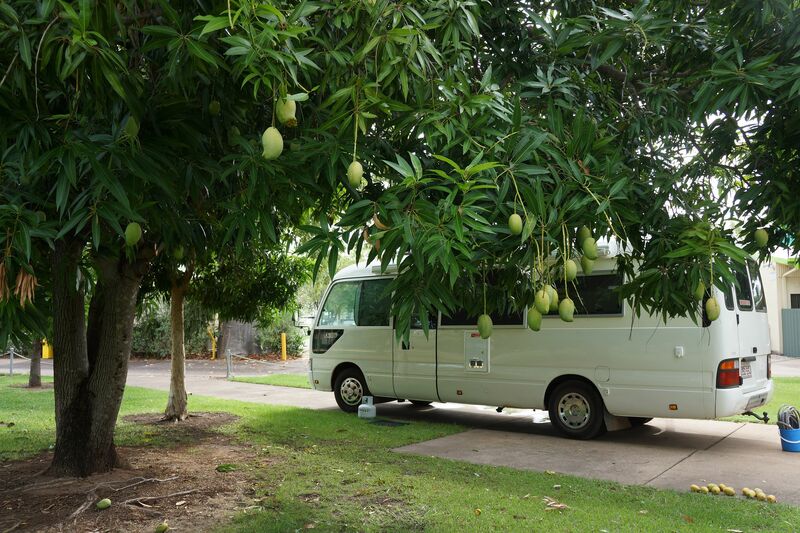 We pulled into the Victoria River Roadhouse for fuel and then parked the bus under some shade while we attempted to repeat our 2013 “croc fishing” exploit from the “old” Victoria River bridge. Just as before, we used empty beer cans, tied to the end of a monofilament line and we dangled these and splashed them in the water. The water level was very low, much less than we had expected, as we had noticed some evidence of recent light flooding on the approach road. 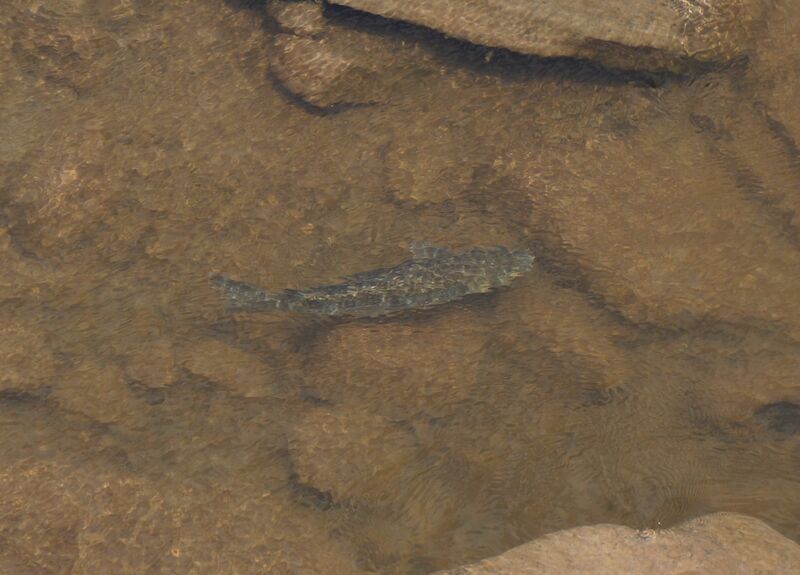 A couple of fish investigated the cans but no crocodile. 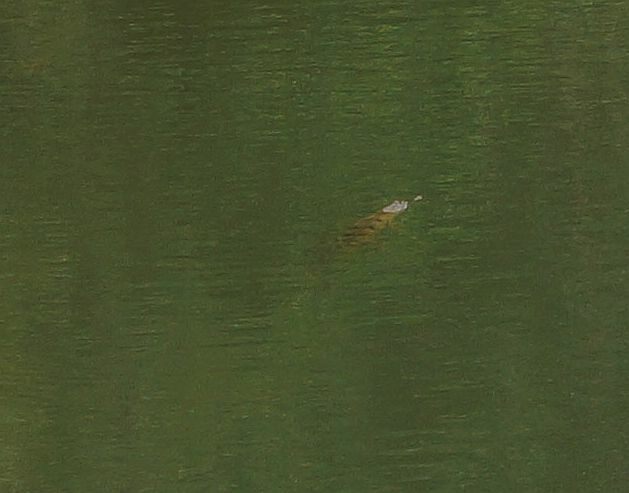 We did see a small freshwater croc, floating lazily in the river about fifty yards away but it sank just after Annette snapped a picture. 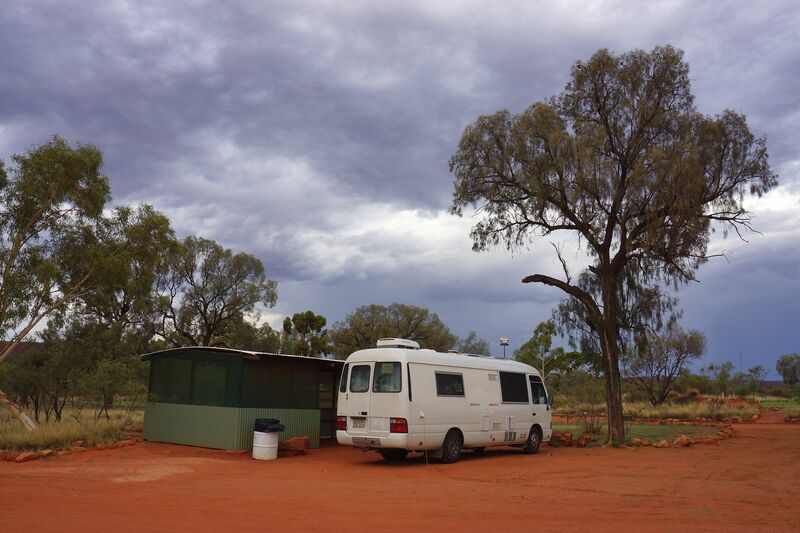 By the time we reached Katherine, it had just started to rain and we pulled into the Riverside Caravan Park adjacent to the Toyota dealer where we have an appointment tomorrow for an oil change on the bus. At 0728 hours this morning, we pulled into the Toyota dealer, waited 2 minutes for them to open the door to the service department and then 10 minutes later, a mechanic pulled the bus into a bay to begin work. The bus has just passed 220,000 kms. and we have driven it near 45,000 kms. since we purchased it. It needed a scheduled oil change, new oil filter, new fuel filter and air cleaner filter. There were no other customers. We sat in the waiting room at the dealership with Annette editing pictures on a laptop and me reading news on an iPad. After one and a half hours, Annette asked me, “Why are they taking so long? I replied, “They haven’t finished going through your underwear drawer yet” but nevertheless asked the service desk girl for a status. She returned to say that they had broken one of the studs on the air cleaner cover and were installing a replacement bolt. It would be ready in another thirty minutes. By the time three hours had passed, I again asked for a status and this time she reported that the mechanics were on “smoko” (morning tea break) but would be finished soon. Total time for the oil change was three and a half hours. I see a franchise opportunity here for “Jiffy Lube”. I note that Jiffy Lube’s price for the thirty minute service I requested is around US$45 plus the cost of the fuel and air-filter. Toyota’s price was AU$600. We checked into the nearby Boab Tree Caravan Park and floated in the pool for the afternoon. In the evening, campsite neighbors Brendan and Lauren invited us for ride in their car to the Victoria River low water bridge. 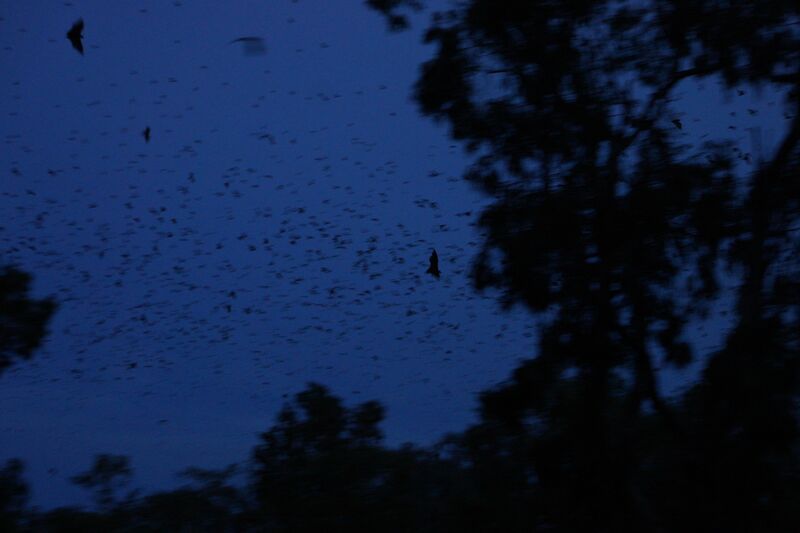 The sky above was thick with the silhouettes of fruit bats, seemingly in their “millions”. The sound of their squeaking was near deafening and we were told that they launch nightly from their roosts and follow the course of the river. We are camped next to a mango tree in the park and the ground at the base of the tree is littered with partially eaten mangoes. We can hear them moving through the tree branches (the bats that is) and occasionally there is the clamor of a territorial dispute. This morning we awoke to the terrible news that our neighbor and dear friend, Bob Lerma, had died of a sudden heart attack. 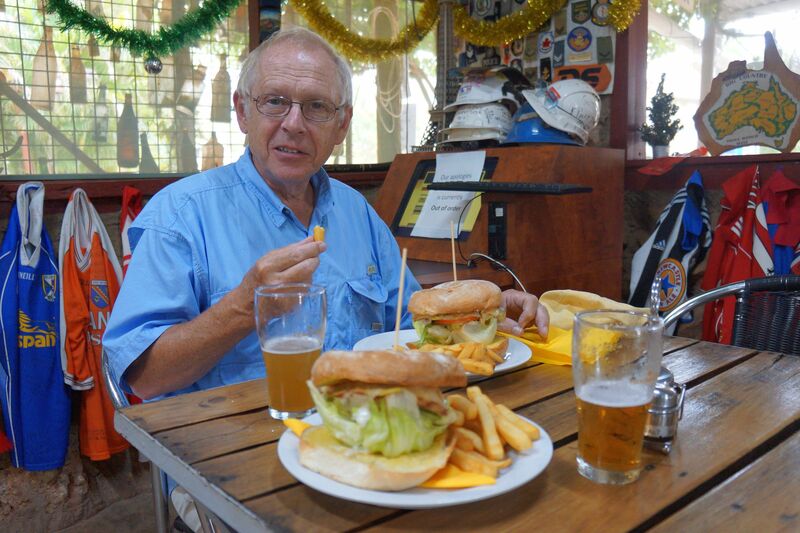 Bob was 69 and when we began to discuss plans for a “walkabout” around Australia, at the time we were sitting in Bob and Sylvia’s kitchen, quaffing beer, while Bob somehow managed to barbeque lamb chop hors d’oeuvres which seemed to go remarkably well with the beer. We had even discussed the possibility of Bob and Sylvia joining us on this adventure in Australia. Bob Lerma was a good friend, a good neighbor and a “good mate”. He will be missed. 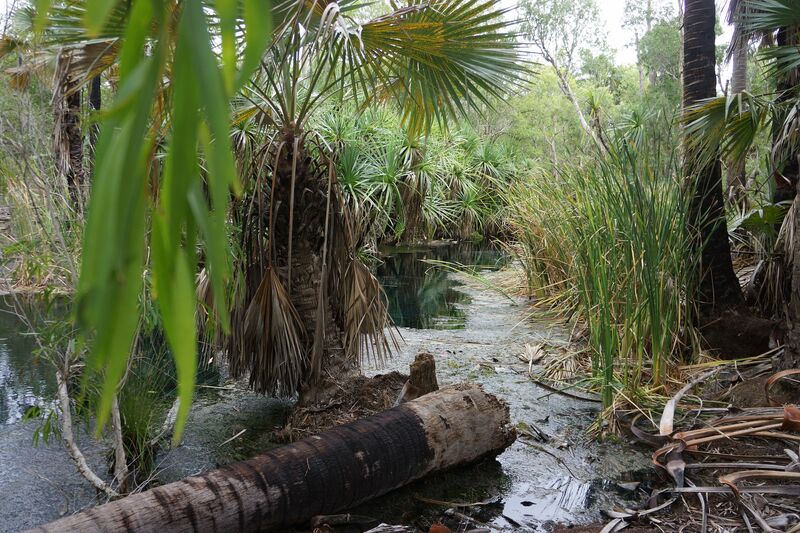 Yesterday we walked the half kilometer or so to the “Katherine Hot Springs”, a natural series of crystal clear water ponds that hold a year round temperature of 90F (32 C). They are hardly to be considered “hot” when the ambient air temperature is hovering around 100F. We floated lazily in the water under the shade of overhanging Pandanus trees. A truly great way to waste away a pleasant hour or so. We finally managed to raise enough energy to drive into town to collect Annette’s new Akubra hat, that has now been fitted with a chinstrap to maintain its position on her head. The other major task was to drive into the bay of a “drive through liquor store”, in order to load up on vital fluid replacements. The liquor stores do not open until after 2:00 p.m. and we have been amazed at the crowds of aborigines lounging around on the sidewalks, or sitting in the shade of an alley in anticipation of this daily event. By 2:30 the crowds had noticeably thinned and the customers dispersed to wherever they hang in the heat of the day. Today we walked back to the hot springs for another exhausting session of drifting slowly in a tropical paradise with a cold beer in hand. 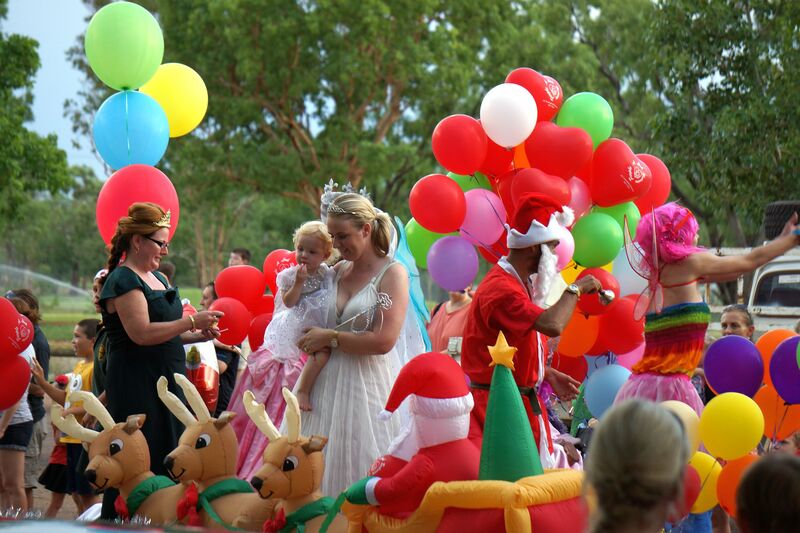 We met Lauren at the pool and she invited us to join her for the Annual Katherine Christmas Parade. This was a wonderful low-key affair that brought us mentally back to when we lived in small town Broken Arrow, Oklahoma. Today the police had closed traffic on a side street, plus shut down all nearby sales of alcohol for the day. 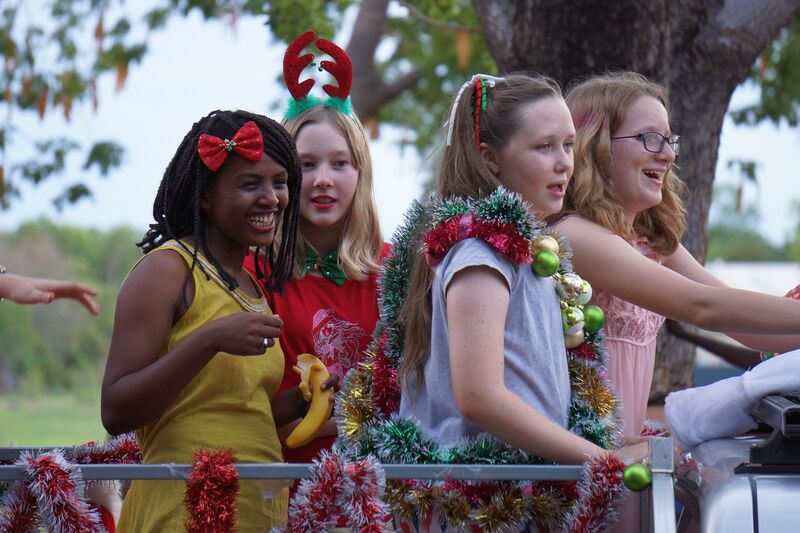 There were stalls selling food, slushies and ice cream, plus locally made crafts, while the Christmas Parade itself was a series of “floats” of local clubs, school groups, fire department and local businesses. 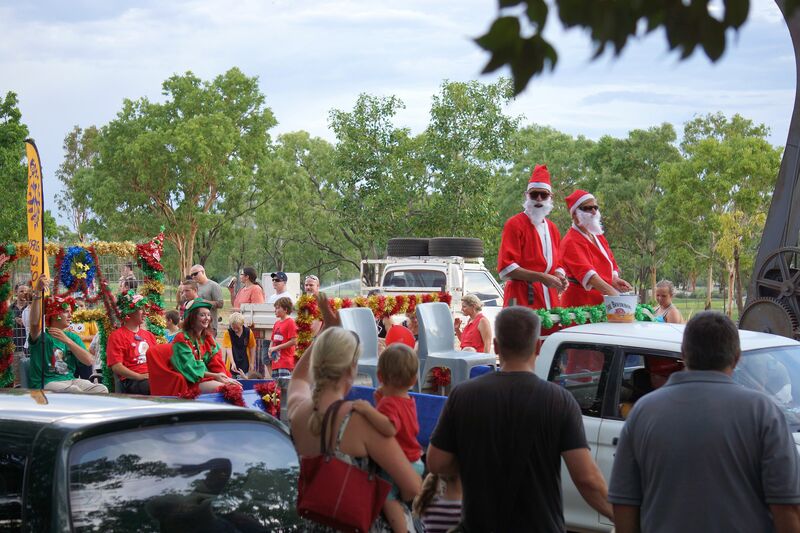 With Santa’s elves throwing candy and beer koozies (OZ speak – “stubby holders”), it was more like Mardis Gras than Christmas but then temperatures in the 90’s do not make you think much of snow and reindeer. We finally dropped the mooring lines and headed off the dock, bound for destinations south. The park manger, Cray tried to load Annette up with mangoes, harvested from the park trees but there is only so much space on a bus. Besides which, unpeeled mangoes have an odd smell, sort of like an old oil refinery or ancient sewer. We stopped in at the Cutta Cutta caves, just south of Katherine, where Ethan relieved us of twenty bucks each and then conducted us on a tour of the cave. Ethan explained that the aboriginal use of repeated words indicates multiplicity, therefore since “cutta” means “star” in the local dialect, “cutta cutta” means “stars”. The aborigines thought that the sparkle of calcite crystals on the stalagmites and stalactites within, might have been stars. 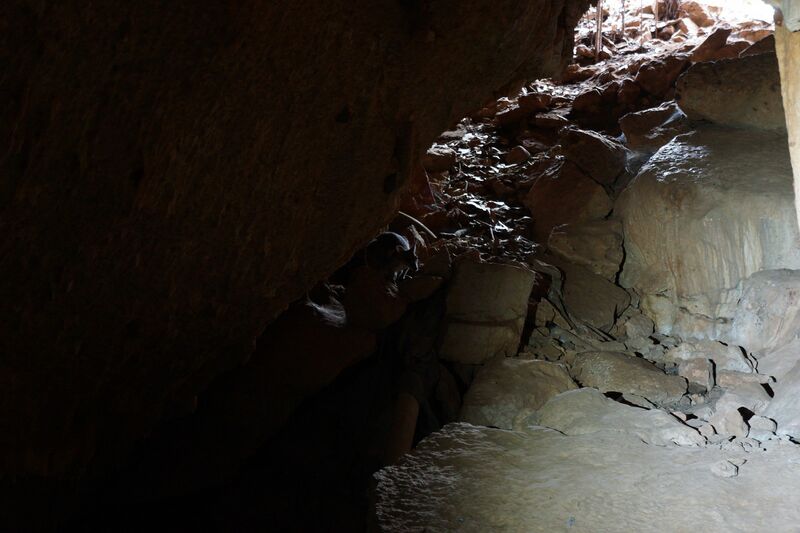 After all, if bats spent the daylight hours in the caves, perhaps the stars did too. 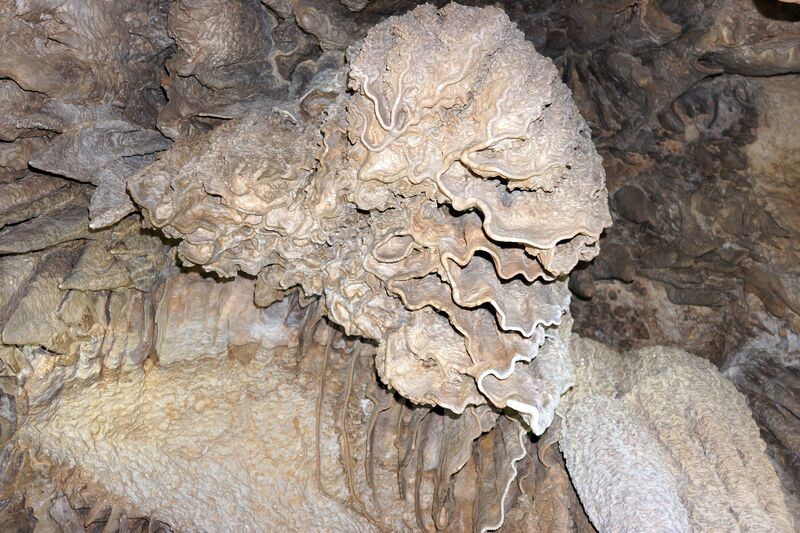 The caves in the area are very ancient, three to four times older than typical limestone caves and the reason, we were told, is because they are not formed formed by the solution of surface water. Instead, they fill from below as the water table rises each year with the “wet season”. 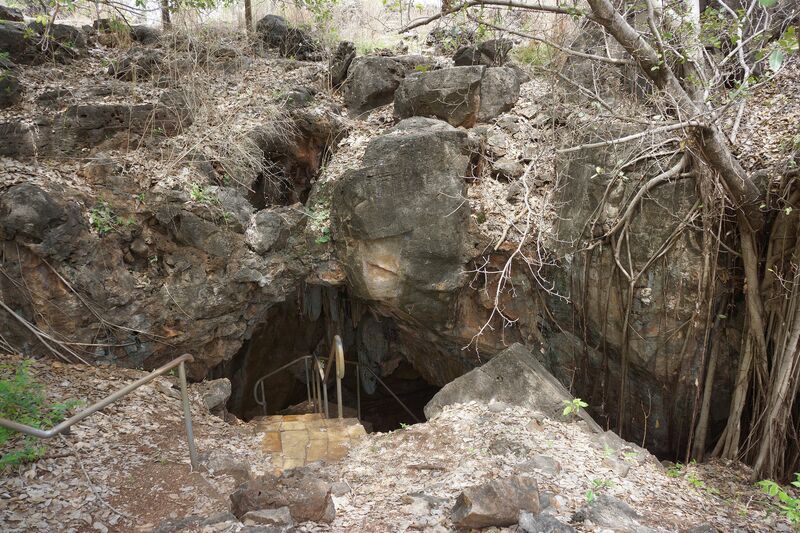 In fact the caves become entirely flooded for a few months and then dry out completely as the water table drops again. The flooding action means no insects can survive, thus no frogs looking for insects and no snakes looking for frogs. 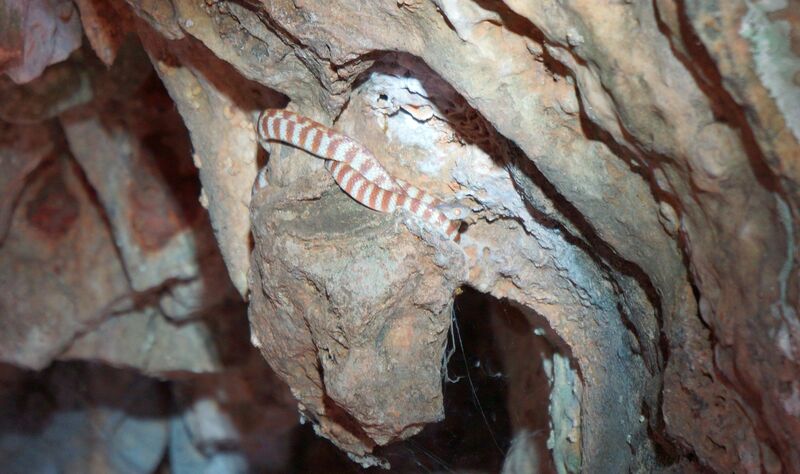 The caves do host bat colonies and these attract predatory snakes at and near the cave entrance, typically banded tree snakes and pythons. 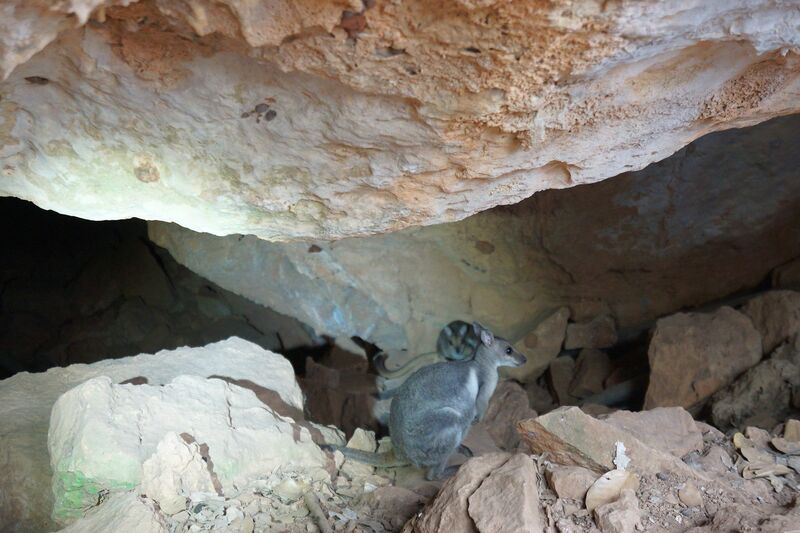 As we hiked down to cave entrance, we saw a couple of rock wallabies as well as a sleeping banded tree snake just over the entrance. 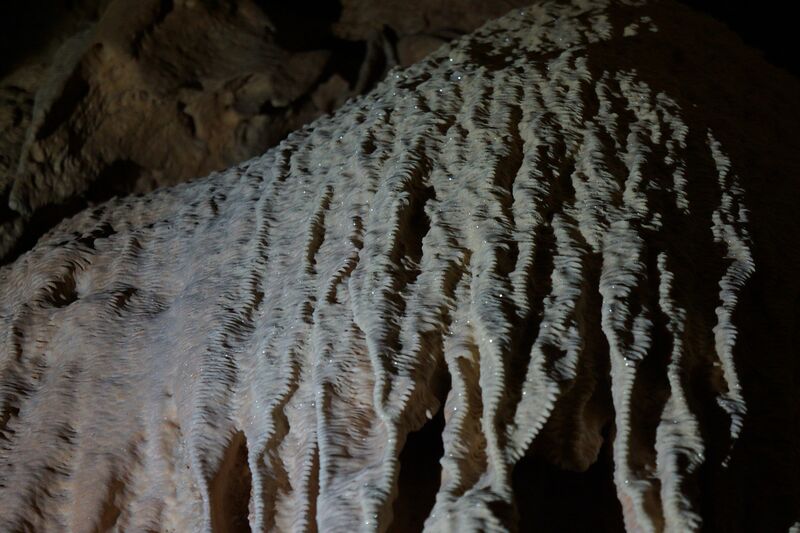 The tour took us on metal walkways a few hundred yards into the cave and we saw magnificent rock formations produced during the few months of the year when the cave has “active” percolation of surface water and before the flooding from below drowns the calcium depositing process. 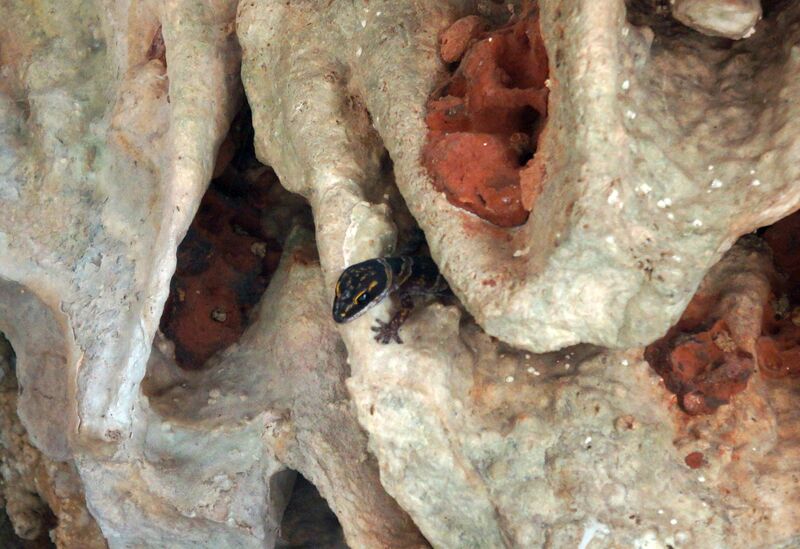 When we exited the caves, we took a bush walk for just under a kilometer but there was little wildlife to see in the heat of the day. 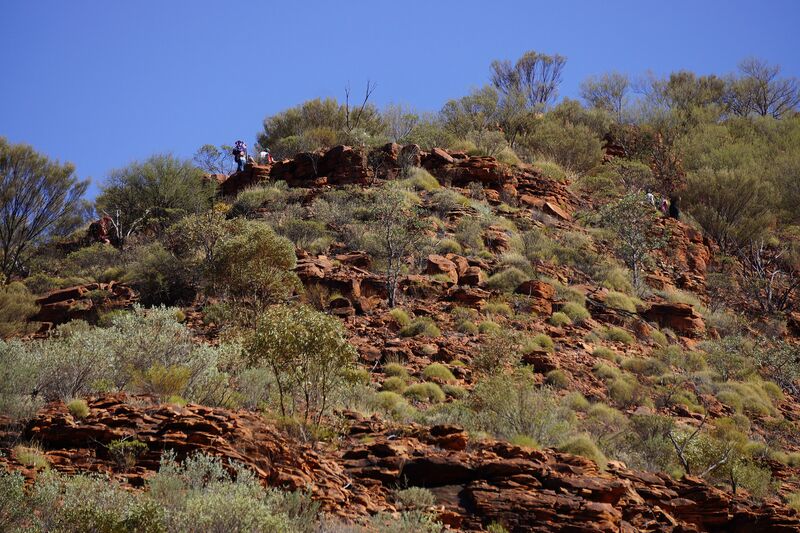 The trail took us through weathered limestone outcrops that had an almost basaltic look, through having been blackened by multiple bush fires. 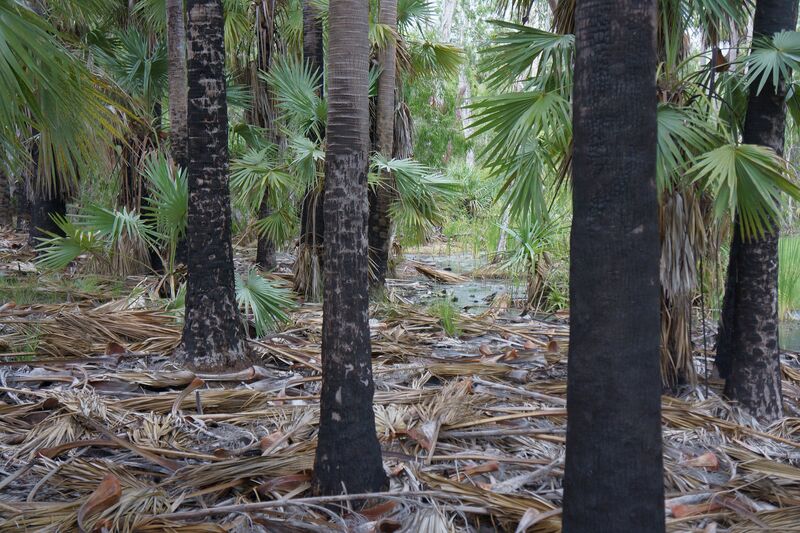 The recent rains eliminated this possibility during our visit and the plants, grasses and trees with their fire blackened trunks, all glistened green with the moisture. Back in the bus and blessing the air-conditioner - sized for 22 passengers instead of just the two of us, we continued south to Mataranka, pulling into the Bitter Springs caravan park. The Bitter Springs are “hot springs” similar to the Katherine Hot Springs we have enjoyed for the past few days. 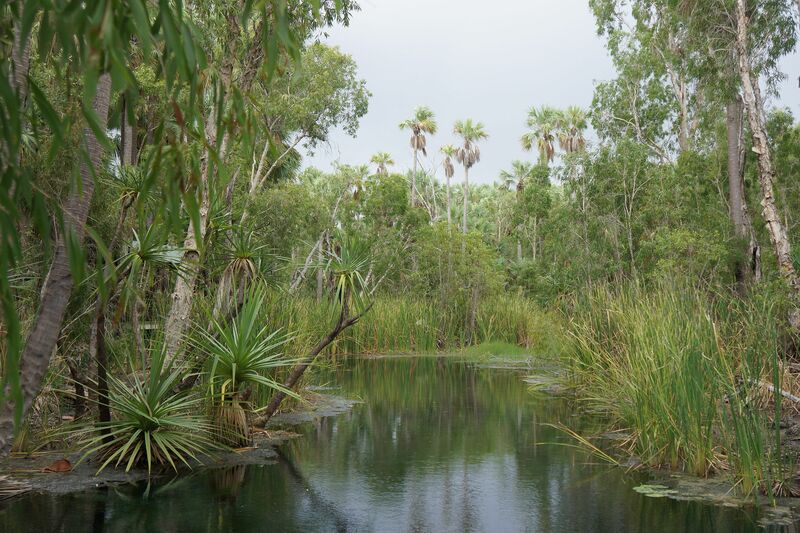 The same crystal clear waters overhung by tall Fan Palm trees and Pandanus but the flow is larger than Katherine forming wider pools with more current. 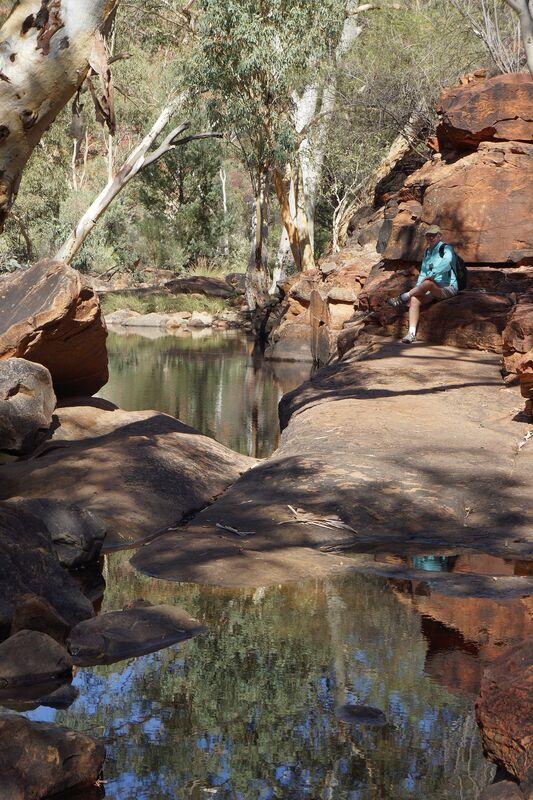 The springs lay just a short walk from our campsite and after our soak, Annette headed over to the park office to enquire about their “Agile Wallaby”. The animal in question is perhaps 24 inches tall and we were warned that if the caravan door is open, she will scoot inside. She loves treats like grapes but the local children have taught her to eat potato chips. 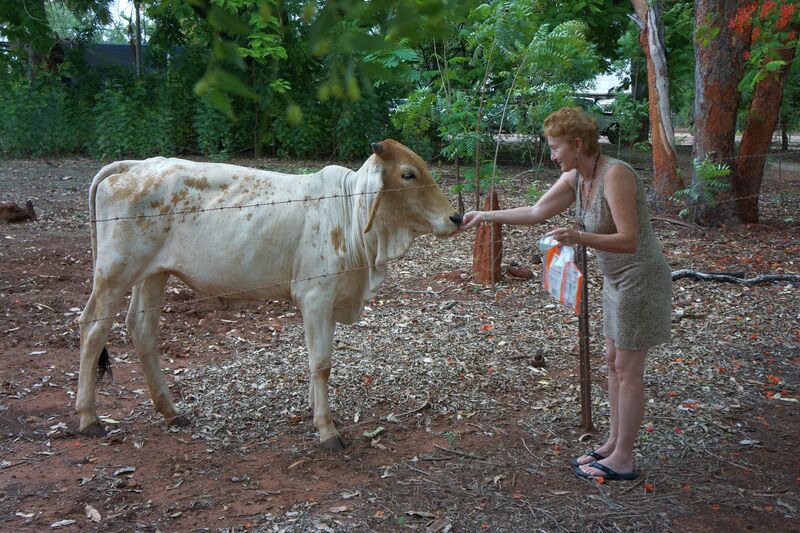 Annette got to stroke her and coo over her and this alone was the worth the price of the campsite. We later saw the wallaby hopping at high speed across the park after one of the other campers. She was just begging for food however. We had decided that it would be fun to spend a couple of days at Daly Waters and visit the places we first saw nearly two years ago. As we were leaving Mataranka, a weather front passed through but this was all wind and no precipitation. However the approach road to the Daly Waters pub showed signs of recent flooding, with large pools of standing water along the road’s edge. Our intended destination of the Pub caravan park was several inches deep in water. 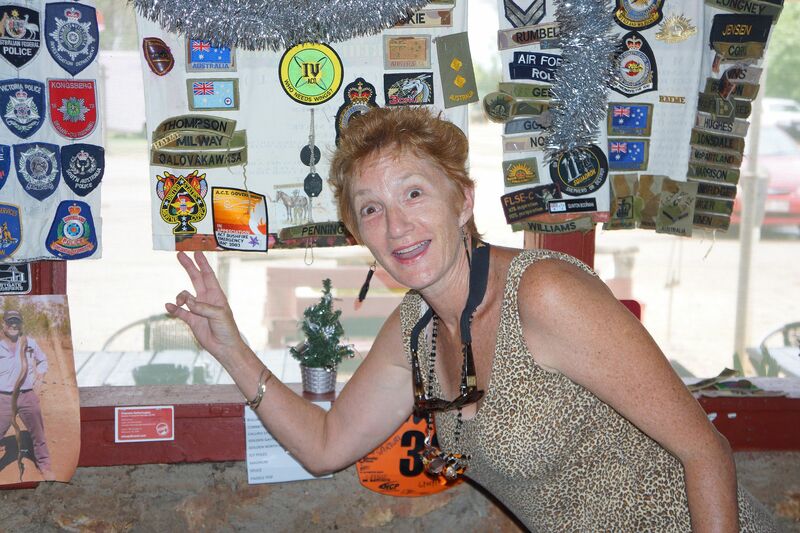 We ate lunch in the pub and Annette was delighted to locate the “Marine Corp” badge that she had donated to their eclectic wall decorations when we visited on 4/11/2013. By now it was heavily overcast and spitting rain and we dodged between the puddles to reach our parked bus. 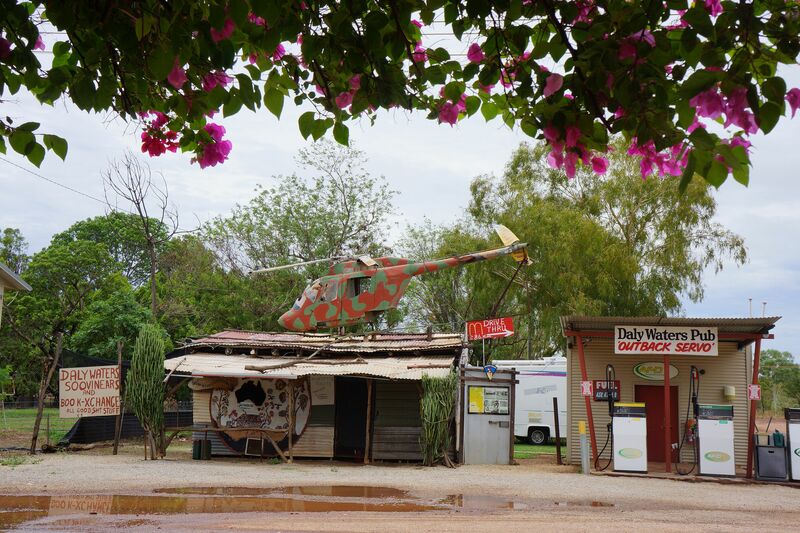 Since Daly Waters was not going to work, we rejoined the main highway and refueled at the roadhouse. Annette checked their caravan park and reported it also soggy. We pressed on down the highway to the next roadhouse at Dunmarra. From the roadhouse parking lot, we could see the caravan park was obviously on higher ground and we decided that for us, this was it. We pulled onto a site and as we set up our power and water hook-ups, we noticed that the lady next to us was struggling to pack and stow a “camper trailer”. This is an Australian phenomenon, a tent built into and part of a rugged trailer. At first glance they are similar to American “pop-up” campers but there are marked differences. The American version is really a “caravan” with soft, folding walls and hard roof but the Australian version is more likely to have a hard “floor” that unfolds next to the trailer to expand the floor space when the tent is erected. There are all sorts of options for these trailers and you can easily pay $20,000 for a fancy version. A storm had hit this campsite last night and the tent “annex” that had been staked out, was blown by the wind and folded itself on top of the sleeping platform, where our fellow traveller lay. She had been trapped for a couple of hours, trying to hold it all down and passed a miserable night. This area has suffered two nights of severe weather, while Mataranka and Katherine to the north have been untouched. Broken tree limbs lay scattered and I hoped that this meant that all of the loose stuff was already down as we prepared for another night of possibly unsettled weather. There was no cell or internet coverage here and therefore no weather forecast updates. While we enjoyed a quiet night at our campsite, three large trucks had pulled in behind our bus. Two were carrying M1-Abrams battle tanks and the third a tracked tank recovery / service vehicle. The M1-Abrams is the main battle tank of both the American and Australian armies and would likely be considered a formidable weapon, if it hadn’t been designed and built by Chrysler. Fortunately for future generations, Chrysler, the worst American auto manufacturer is now owned by Fiat, the worst European auto manufacturer. 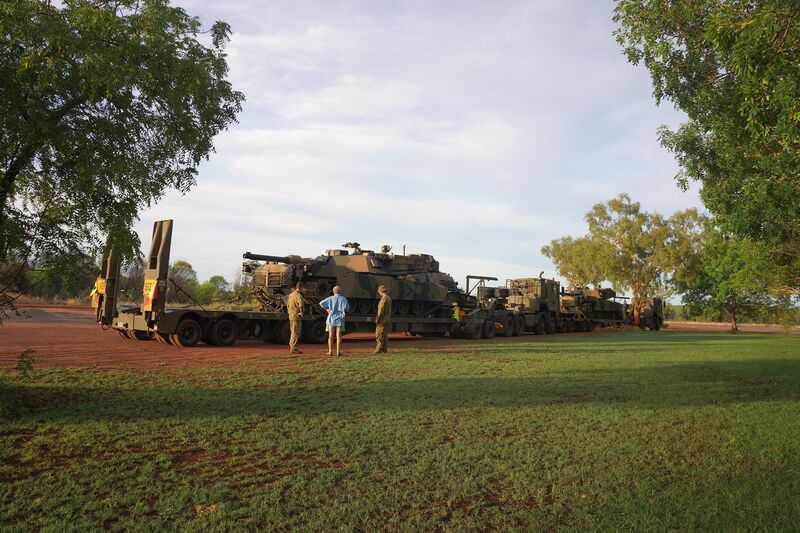 We walked over to chat with the Australian Marines who were returning with their 70 ton tanks from a training exercise. 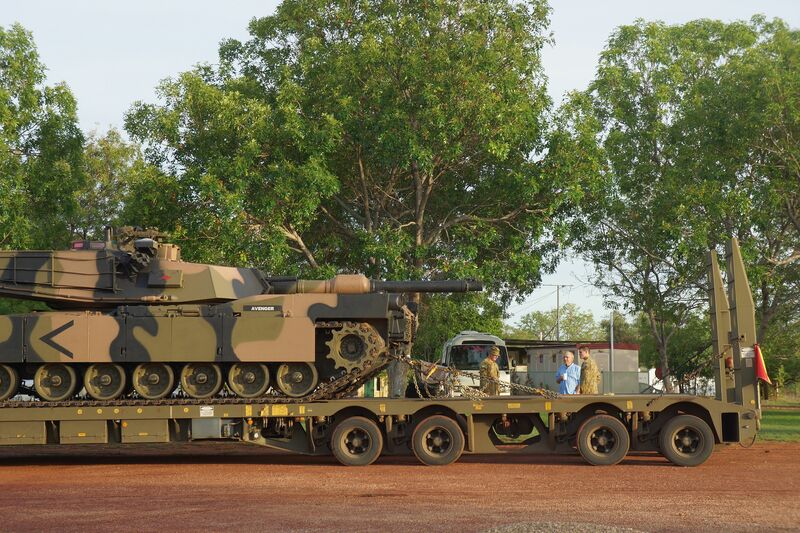 They left early and we hoped that they had a good start on us, since the 12 foot wide Abrams would constitute a “wide load” and these do not fly down the highway at the customary speed of the ubiquitous Australian “road trains”. We too headed south in heavy overcast and there was evidence of previous heavy rain on the roadsides. We passed a wallaby on the side of road, which waited patiently until we passed and in the rear view mirror, I watched as it “ran?” across the road behind us. The dawn grazers were still around and we slowed down in anticipation of other animals. A few kilometers later and on our left, a dead “Joey”. On our right, the mother, a full sized “Red” kangaroo sat anxiously waiting for a child that would never “come”. A tragic image that would haunt us all day. Several flocks of budgerigars hurled themselves at us and I heard at least one hit. We dodged small lizards sitting frozen on the highway but know we must have hit a couple. They just look like wisps of disintegrated rubber tire, until you are on top of them and too late to change course. So we continued on our way, trailing death and mayhem behind us. There were scores of Eagles in the roadway, eating “road kill”. We would blast our horn in warning and they usually respond but are famous for a very slow take off and slow rate of climb. Then they sometimes circle back in front of you, a 12 pound bird at windscreen height. 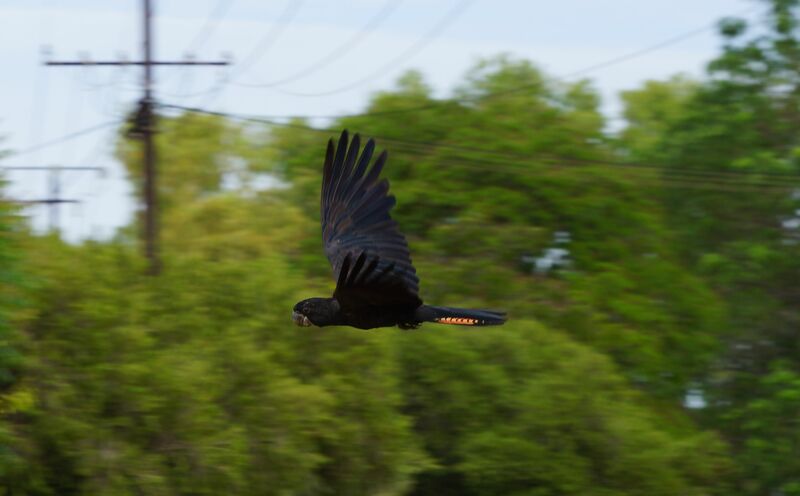 We have observed that many species of birds fly very low in Australia, through the bush and often just a couple of feet off the deck. They fly into the side of the bus, often at the rear. Why is this? 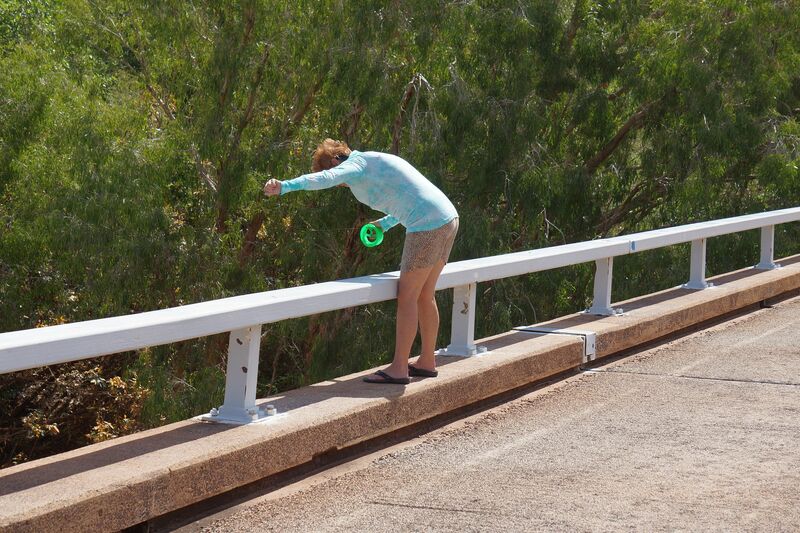 We have not seen that many accipiters in Australia and it is not a common habit of birds in the USA. Perhaps time and our vehicles have weeded out all of the low-flyers. From Newcastle Waters south, the trees began to thin out. 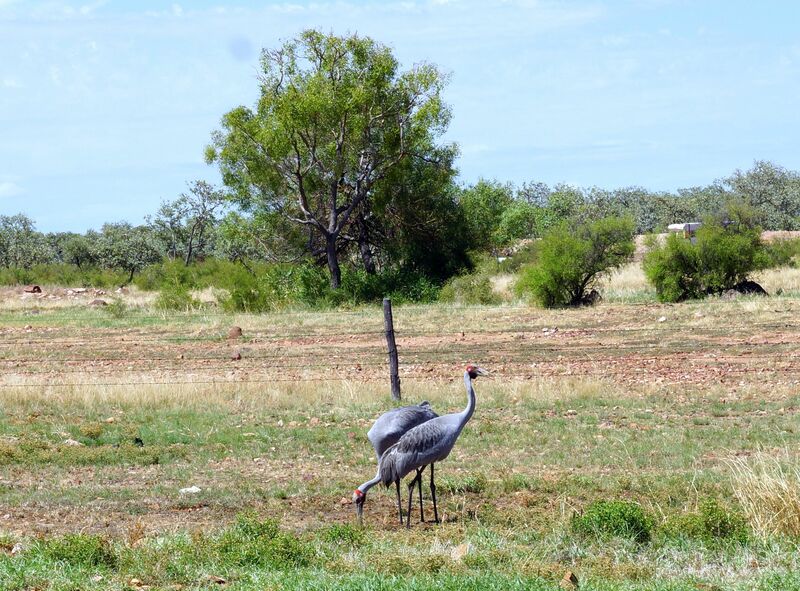 We stopped to photograph a pair of Brolga cranes (standing 4 foot high with a 7 foot wingspan) and they continued to graze, totally ignoring us as we yelled in an attempt to get them to smile. By the time we pulled into Tennant Creek, the clouds had cleared and it was hot, the park swimming pool a welcome place to cool off. We experienced some heavy weather last night with lots of rain, lightning and the power went out several times. Actually there was no “we” involved, I slept through all of the excitement and Annette told me about it this morning. We then spent the morning chatting with park manager about the economics and difficulties of running a caravan park. You can take a college course on “caravan park management” but his tales of dealing with the cheats, deadbeats, drug dealers and crazies would be enough to put anyone off. You really need someone like Luca Brasi to help out (the one who now “sleeps with the fishes”, not the band from Tasmania). 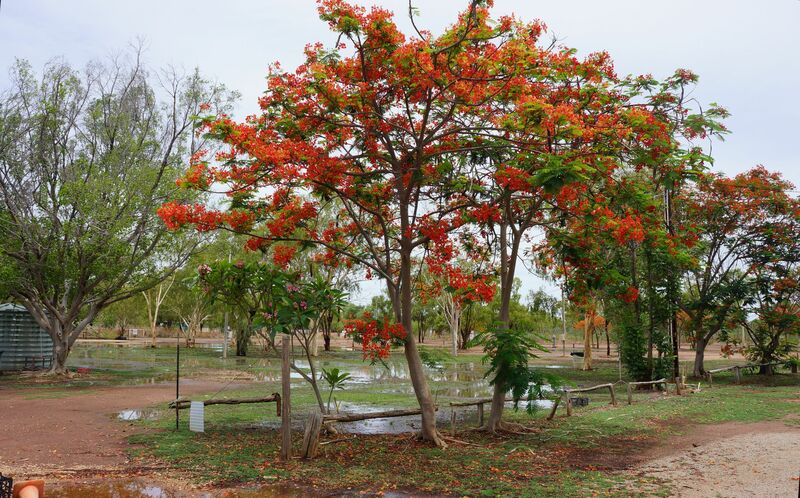 John Stuart named the small creek north of Tennant Creek in 1860 and 12 years later, a stone built telegraph repeater station was located beside this water source. This would have been a popular posting, about as far away from civilization that you could get. A really lonely place until the 1930’s when Australia’s last gold rush occurred nearby. Gold was first discovered in 1926 but the real action began after the third strike in 1932 during the Great Depression. 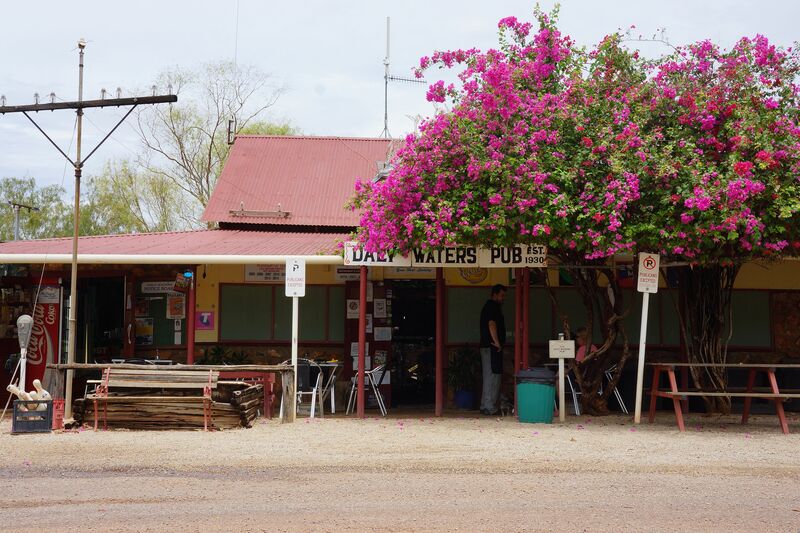 Today’s town was located 7 1/2 miles from Tennant Creek, either because the government had granted the telegraph station a 7 mile reserve, or because in 1934, the pub was located here. Regardless of which version you prefer, water had to be carted from the creek for the miners and their families. We visited the Battery Hill museum, site of the government run 10 head ore stamping mill that ceased operation in 2005. This was a rock crushing plant that crushed the gold bearing ore from various mines. The mine buildings have been converted to displays and one building had a great collection of photographs from 1930’s showing hardships of frontier life. In 1932 there were 600 miners here including 60 women and children. Sickness was rampant from drinking sewage contaminated water and finally the government was called upon to provide a well for bore water for the town. For me this is a little strange that the Australian government was called upon to provide water for mining operations and indeed the gold extraction machinery was also government operated until just 9 years ago. I am used to regarding our government as a form of organized crime, rather than providing any kind of social or economic benefit. An occupational hazard of working in the oil business I suppose. We next drove up to “Bill Allen” lookout with great views over the Barkly Region, today mostly cattle grazing. The lookout is on top of a knoll just east of town that supports the town water supply storage tank and Bill Allen was a local government worker who supervised utility and road construction in the area. See, there again, in the USA we would have named the hill for some scumbag politician or other, rather than someone who actually did something. We itch! We both have multiple swollen insect bites and we have diagnosed these as “White tailed spider” bites. We haven’t done the convulsions and death yet, thus were able to eliminate a couple of the other Australian species of arachnids. Annette has sprayed the inside of the bus liberally, just in case we picked up any hitchhikers but we haven’t actually seen any bugs on our bus, other than a couple of flies that were too dumb to leave when they had the opportunity and thereafter suffered the consequences. 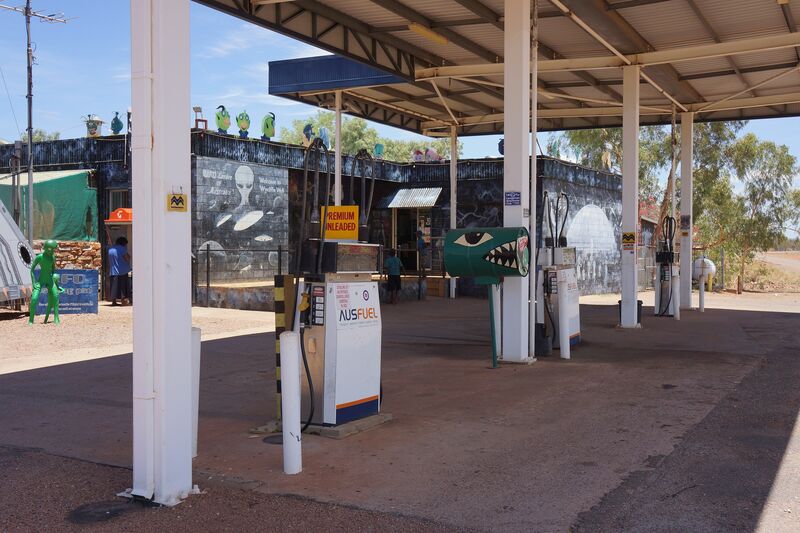 We left Tennant Creek and headed south on the Stuart Highway. The termite mounds are sharp and pointed, like stalagmites, clustered closely and carpet the ground to the horizon, their near brick red color contrasting sharply with the bright green of the freshly watered bush. For the first time we saw a line of electric utility poles, paralleling the highway. The power poles are steel, as are the fence posts, a precaution against ants and the frequent bush fires and their metal presence reminds us that this highway parallels the railway line connecting Adelaide and Darwin. 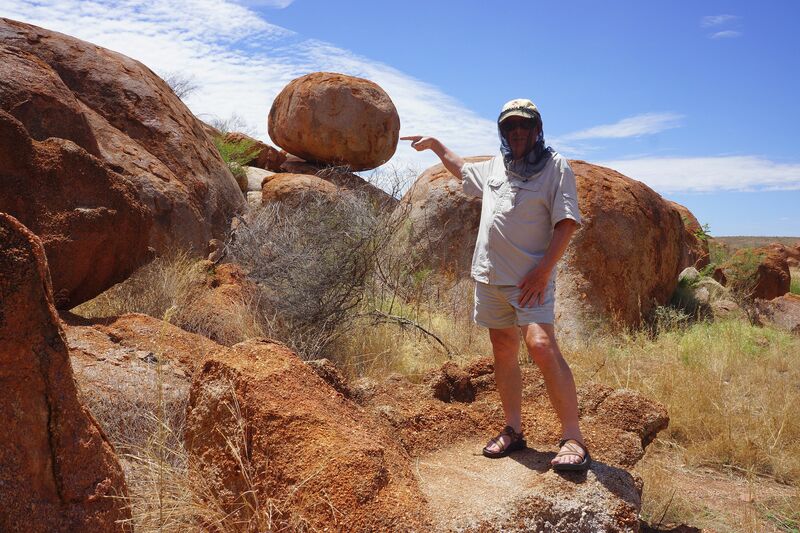 We detoured to visit the astonishing granite outcrop called the Devil’s Marbles or “Karlu Karlu” in the Aboriginal dialect (meaning something like “round things” - at least according to the sign at the park. Not super definitive but then again, maybe there has been a shortage of “round things” in the bush). 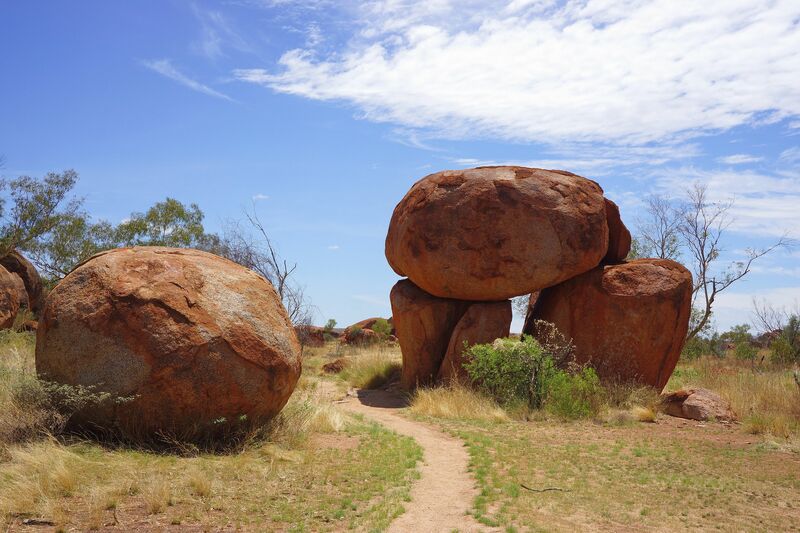 The outcrop is a granite dome that has been weathered along natural fractures and has produced what appears to be rounded boulders, in some cases precariously balanced on top of each other. 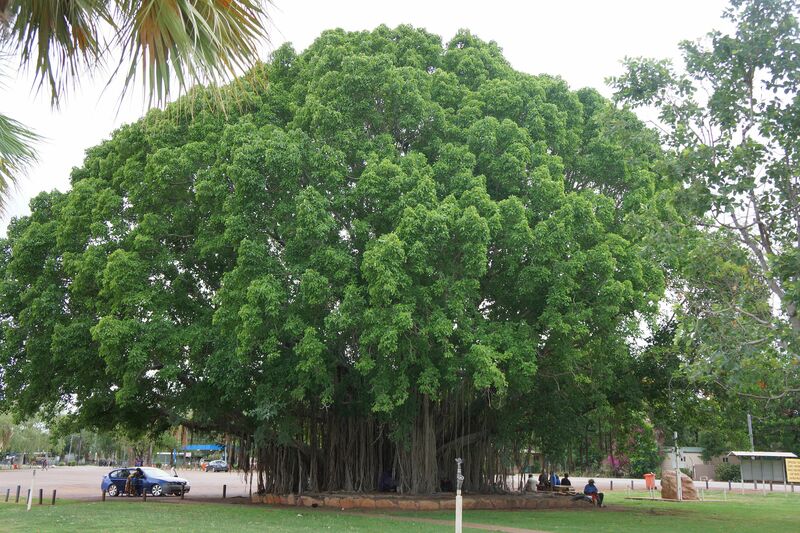 We visited this park in 2006 and used a photograph as the background for the web-site. (BTW, the secret to looking eight years younger is to use a photograph of yourself from eight years ago). During our 2006 visit, the park was crawling with tourists and the photographers lined up for their opportunity for the staged picture. On this visit, we had the entire park to ourselves. 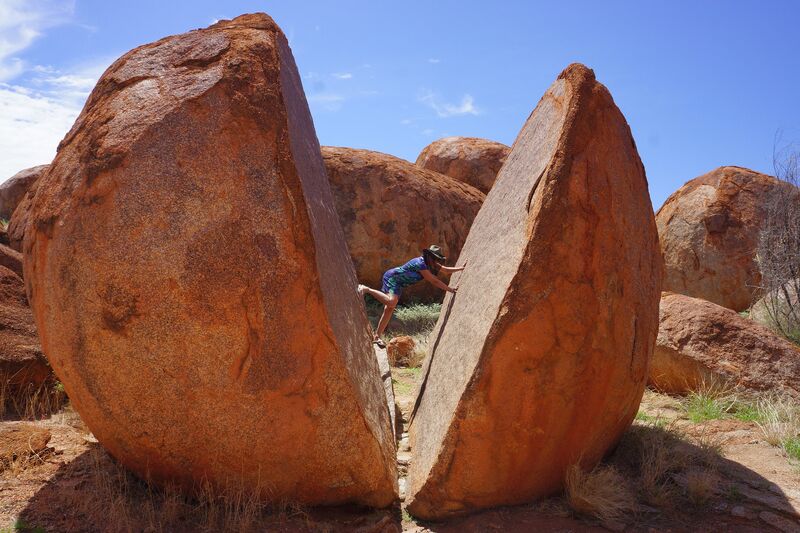 We walked a trail between the boulders and were again amazed by the bizarre formations. Some huge boulders were split in half, as cleanly as if they were gemstones and yet there was no evidence, such as shattered fragments, to suggest that they had fallen. Back on the highway our next stop was at Wycliffe Well but the UFO museum was closed “for the season”, presumably flying saucers aren’t particularly waterproof. We blew out of there noting that there are now speed zone signs with an additional warning to “watch out for people”. Kangaroos and stray cattle seemingly insufficient hazards. 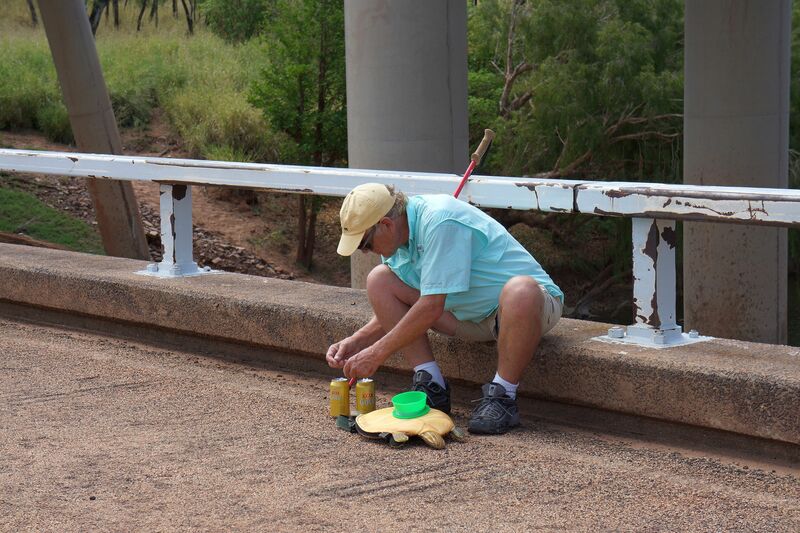 We checked the roadsides for human road-kill but little evidence, well actually none, that this is a common problem. 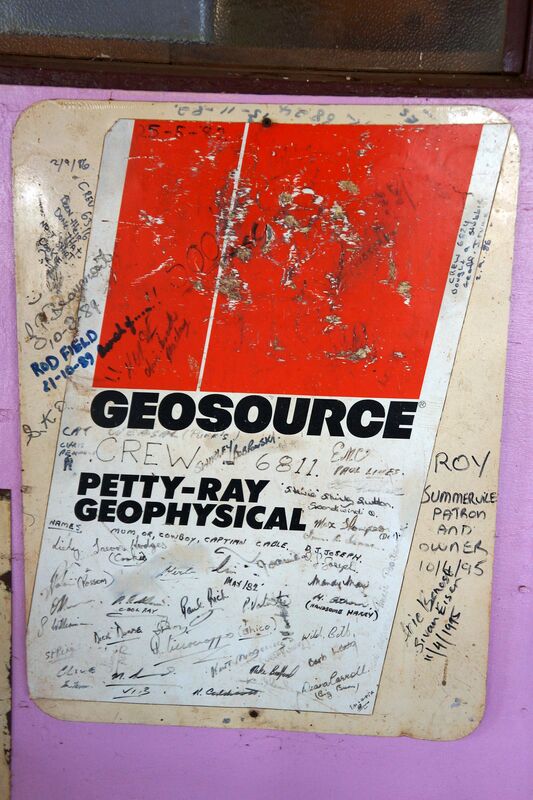 At the Ti-Tree roadhouse, we paid a record $2.15 per liter for diesel (AU$8.17 per gallon) and I would have demurred but we plan a long detour for gemstone fossicking. 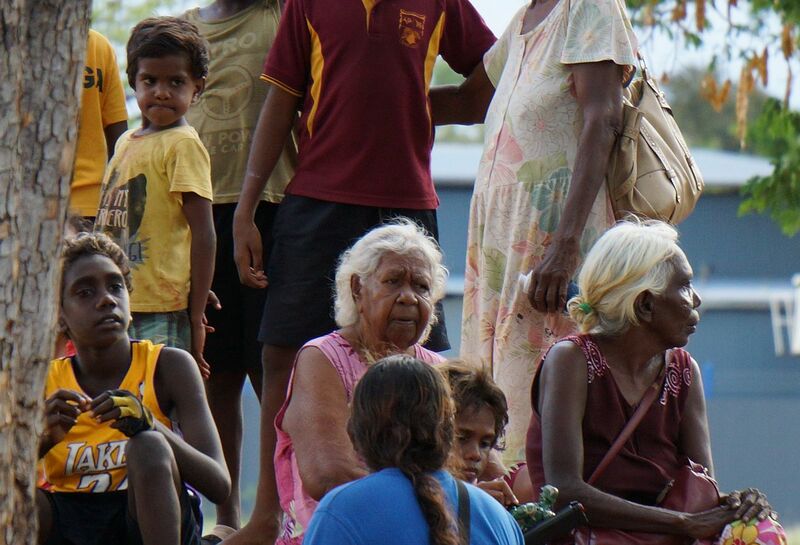 Outside the roadhouse were aboriginal people, sitting in the shade of the roadhouse porch in a long line. When I went inside to pay for my fuel, a half dozen men followed me inside. The lady at the cash register brusquely ordered them back outside, stating firmly, “It is not two o’clock yet. The bar is closed!” The clock she pointed to showed a time of 1:52 pm. The clouds above had been building throughout the afternoon and presented dark bellies, tinged in pink. 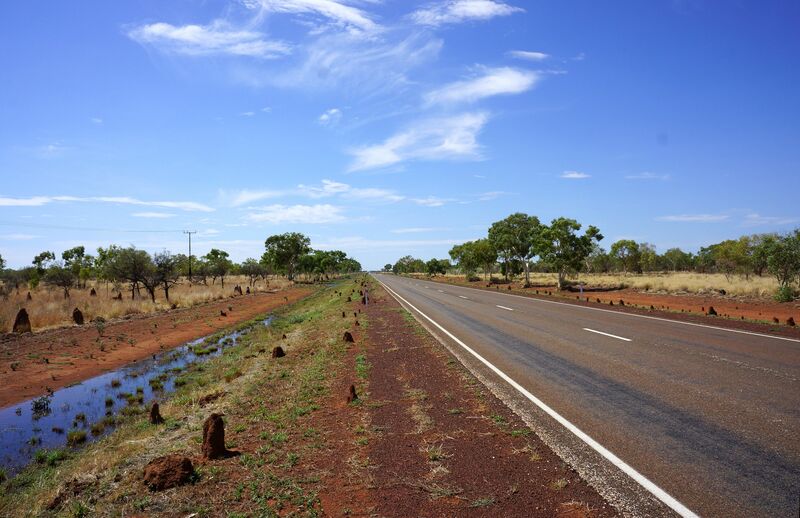 Some 50 miles short of Alice Springs, we turned eastwards on the “Plenty Highway”, highway being a loose term for the single lane blacktop that stretched out before us. In the distance we could see a large cumulus cloud dumping heavy rain and we tried to estimate its distance and direction of travel. This is difficult when you are rocking along at 60 mph yourself. There was no road-kill on this highway, just cattle scattered about in the bush, sometimes huddled under a tiny tree for shade. We crossed two riverbeds and although there was evidence of recent water, with sediment and dead branches across the road, the riverbeds were still dry. It was not until we were within a mile or two of our destination that the road itself was wet. We pulled into the Gemtree caravan park to find ourselves as the only campers and made arrangements for a fossicking trip on the morrow. We rose early to go fossicking and today we are on a quest for garnets. For the jewelry challenged (like me) these are semi-precious, red gemstones, looking like shards of broken red glass. We loaded our bus with pick axe and shovel, 5 gallons of water, a washing tub, four sieves, a dirt bucket, plus the all important rusty tin can for our garnets. Next was a 19 mile dash along the single lane blacktop to the east, following our “guide” in his ute, with us driving our bus. The last mile or so was on dirt and we did not even attempt to stay up with our lead vehicle, since we expected to be able to tell by his dust cloud if he turned off the track. In fact he waited for us at the turn off (probably because we hadn’t actually paid him yet) and we followed him yet deeper into the bush. After a couple of hundred yards or so, we were in an area that perhaps looked like the Somme in 1916, with mounds of dirt and shallow trenches everywhere. This was the garnet field and we were next shown how to find them. The first stage was to use the pick axe to dig the dirt, as the garnets are found in the top two feet of soil. 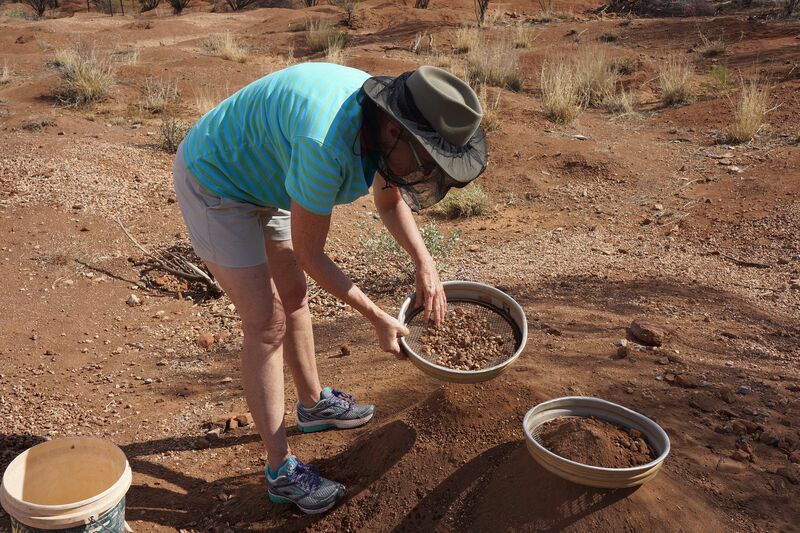 Then the dirt was broken up and shoveled into a bucket before being poured into a “dry” sieve, the latter shaken and the loose dirt dropped through leaving behind small stones. 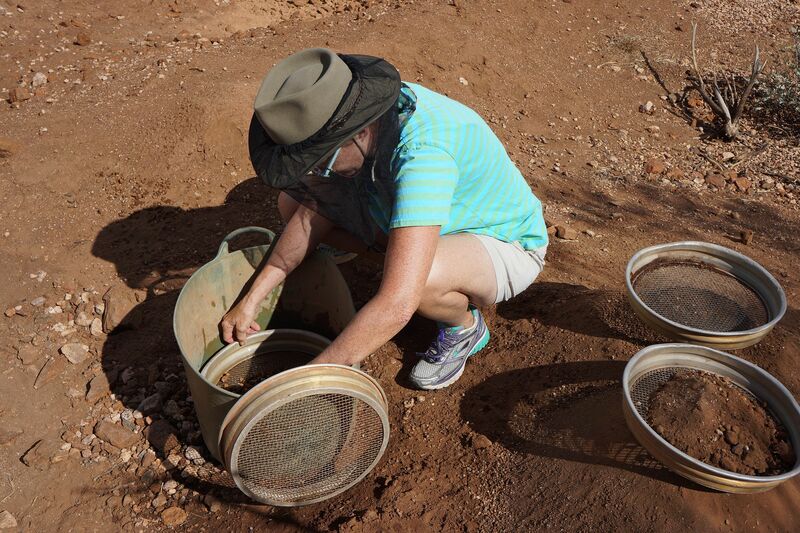 The more obvious limestone pebbles were discarded and the contents of the “dry” sieve poured into the “wet” sieve. The washing tub had been filled with water to a depth of eight inches or so and the “wet” sieve, submerged, shaken and the like, to remove the balance of the soil. Next the sieve was held above the head, dripping with muddy water and by looking through the stones from below, the sunlight was used to identify red color. 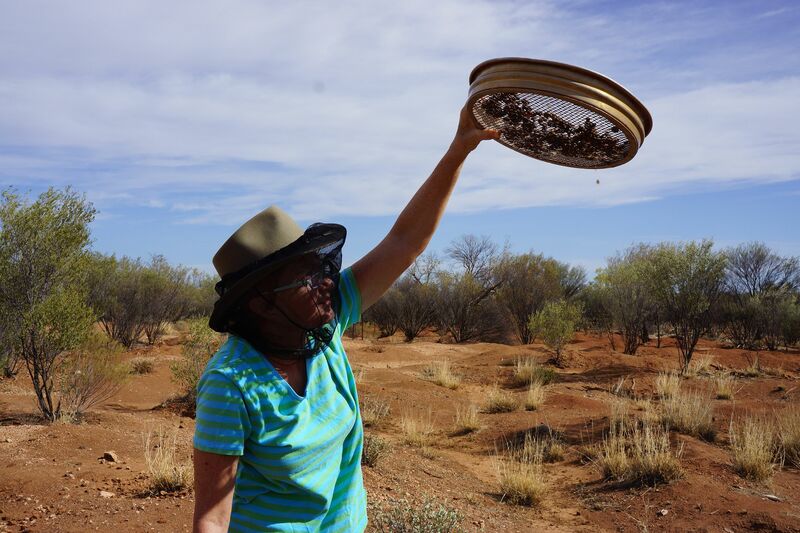 Hopefully the sieve might contain a garnet to be plucked out, dropped into the rusted can (the rust is required as a badge of mining authenticity) and the process repeated. 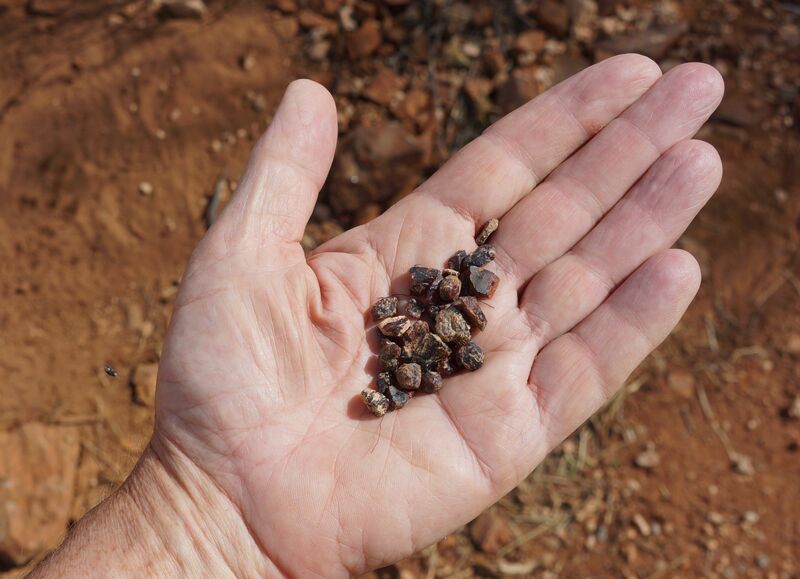 Of course we have been known to rehydrate with beer instead of water and during a necessary break period, I noticed that that the recent rains had left garnet fragments on the surface, washed clean of dirt and already gleaming in the sunlight. Thus we decided to forgo some of the more labor intensive steps of traditional gem mining and simply walked around picking them up off the ground. In fact I found a nice sized garnet lying about a foot from the front wheel of the parked bus. Overall this was a fun endeavor and we finished up with several tablespoons volume of raw garnets including five stones judged to be large enough to produce cut gems of up to 4.5 mm size – about one third of a carat weight. It was becoming hotter when we returned our equipment to the caravan park and chatted to the current owners who are both school teachers. Their own children have been home schooled using “School of the Air”. At one time this would have been by short wave, two way radio but of course today this is via satellite internet, with personalized web-cam tutoring. Only the early grades are taught this way and we were told that by age eleven, all families living at the remote stations send their children away to boarding school. We discussed teaching salaries and discovered that the Northern Territories pay teachers near double what teachers currently make in Texas and this amount triples if the teachers choose to teach in the aboriginal communities. 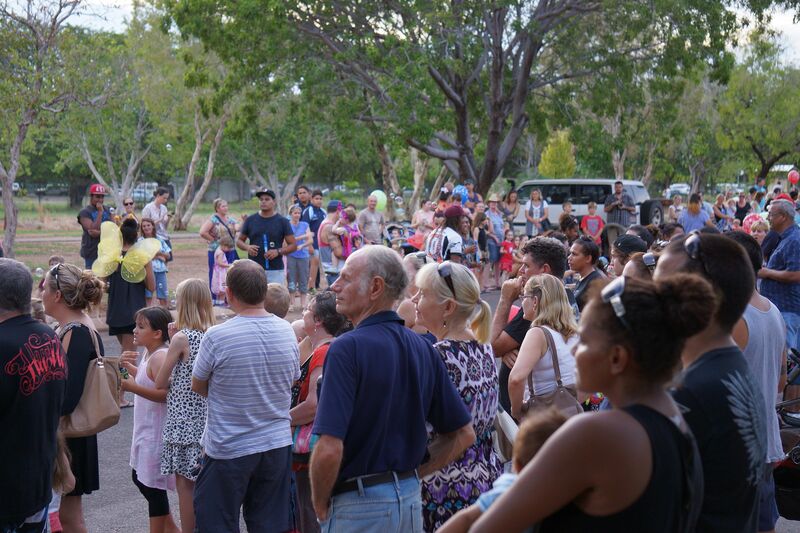 I had commented on the absence of any school bus “stop” signs near these communities and was told that the Australian government provides two teachers to each aboriginal community. In addition to the pay bonus, the teachers are usually provided free housing within the community. 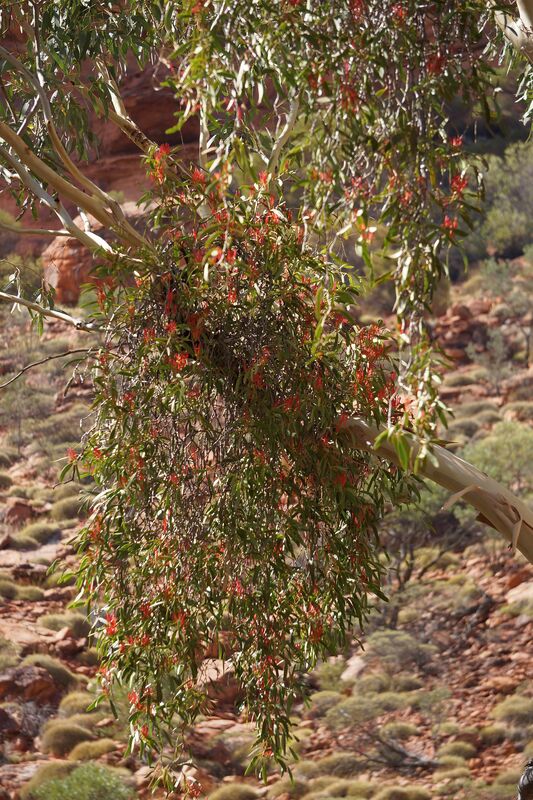 We bade farewell to Gemtree and headed back down the road to the Stuart highway. Again we were brought to a standstill by cattle on the road and have proven by the “honking horn” experiment, that cattle are in fact dumber than birds. We also stopped to examine strange features by the roadside that appeared to be grass circles, perhaps a foot in diameter and four inches high. 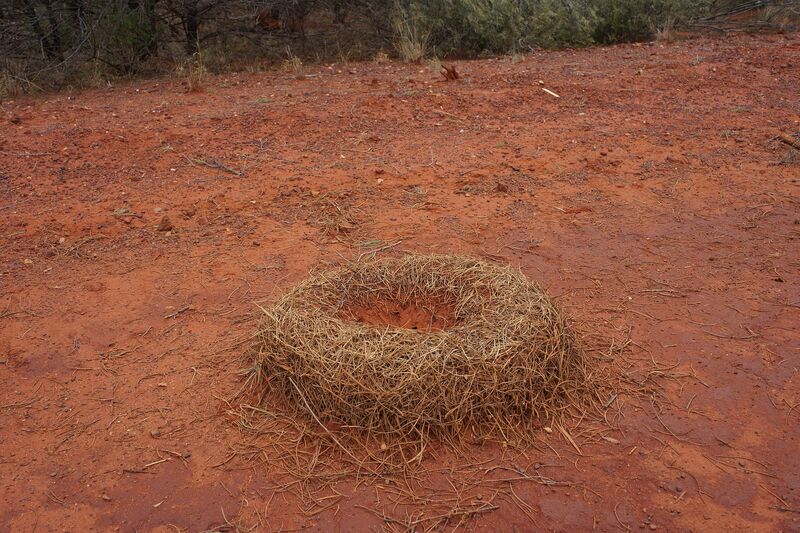 We saw that these were ant nests and the ants were bringing sections of Spinifex and Acacia leaves to the surface, as though they were drying them. We later learned that these are Acacia ants and the ants produce these distinctive nests with their entrance raised four inches above ground level, as protection against local surface flooding. 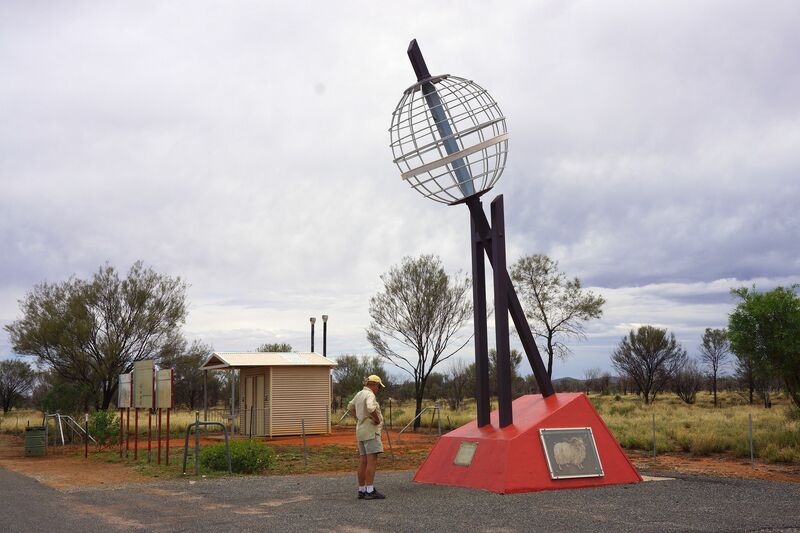 We again passed the Tropic of Capricorn just outside Alice Springs and although we searched the bush on either side of the highway, saw no camels. How are the three wise men going to make it into town? A “Slow day” spent catching up on bills and chores. It is still hot here in the heart of Australia but the humidity is noticeably less than Katherine and Tennant Creek. Annette had picked up a DVD titled: Grey Nomad 103, Caravanning “The Wet”. The video ran for two hours and was produced by Sid Whiting. He had a score of segments, some selling or demonstrating a particular piece of equipment, some reviewing museums or gift galleries and some segments with recommendations and hints on driving safety. Sid discovered that many of the side trips to the swimming holes he had intended to visit were closed off during this season (usually because of crocodile hazards) and many tourist businesses were simply closed. He also discovered that it is hot, humid and wet during the “Wet”. Sid even had a segment of him in his skivvies, refueling a Honda generator at 3:00 a.m. so he could resume his “bush camping” with air-conditioning. We did agree with Sid that the scenery and colors are magnificent and augmented by the absence of crowds but his summary of the trip was classic; basically that he and his partner would likely never again caravan in “The Wet”. We drove into town this morning for a few items at the hardware store and then headed over to the downtown information center. There was no easy parking for a bus and the signs leading us to caravan parking, terminated at a set of barriers blocking off the empty parking lot. We finally found an abandoned building site and parked in the dirt. 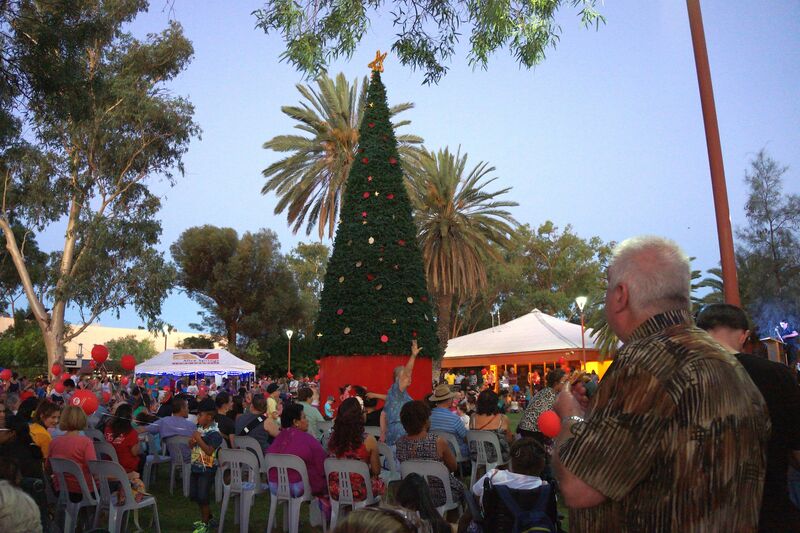 The main shopping area was a hive of activity with the town preparing for the lighting of the Christmas Tree festivities. We decided that a grocery store in the suburbs would be easier for us for schlepping quantities of drinking water and beer, since downtown groceries generally have multi-story car-parks that are not bus friendly. We had already learned that beer could only be purchased after 2:00 p.m. and while Annette was wandering the grocery aisles, I was buying the booze. When I asked for Port, I was told that it could only be purchased after 6:00 p.m., one bottle per customer and your driver’s license must be “scanned” to prevent multiple purchases. We attempted to return to our caravan park only to discover the highway exit blocked by a half dozen police cars making an “alcohol” stop. To my left, a policewoman waved at me to pull off the highway to be breath tested, to my right, another policeman waved at me to continue straight, bypassing the barrier. I tried my best to look confused (not difficult in my case) and drove straight on. We passed a dozen or so parked cars, with a score of unhappy people sitting next to them in the process of being arrested or waiting for rides home. It was but 3:00 p.m. and the bars have only been open for an hour. Even before we had witnessed the aggressive anti-alcohol campaign, we had decided to ride a taxi to downtown. Here were hundreds of people milling. Stalls had been set up selling crafts, food and drinks and many of the local stores were still open. 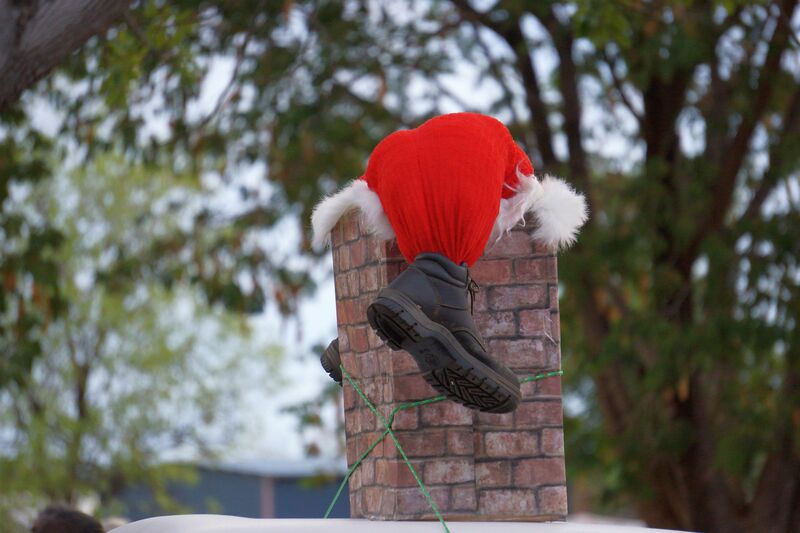 The police had barricaded off the shopping areas to automobiles and several bands competed with Christmas music. 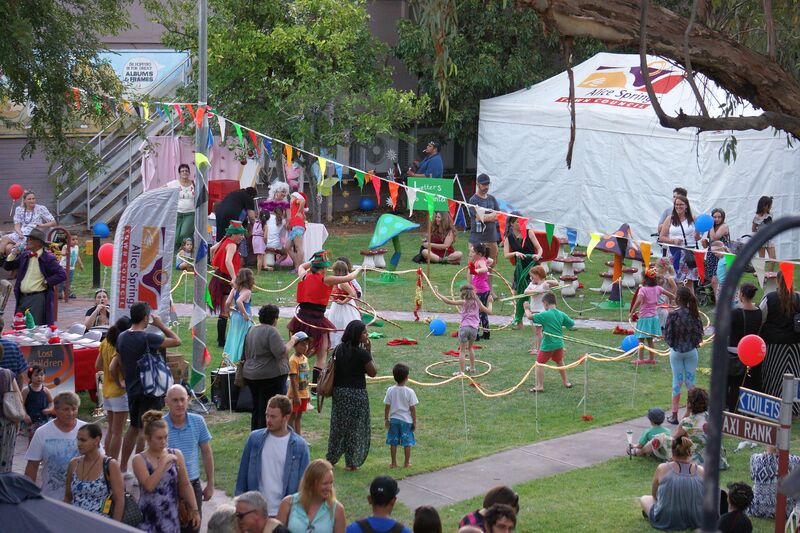 There were buskers, lots of pretty girls in Santa’s Elves costumes, children getting face paintings or lining up for a huge inflatable slide. 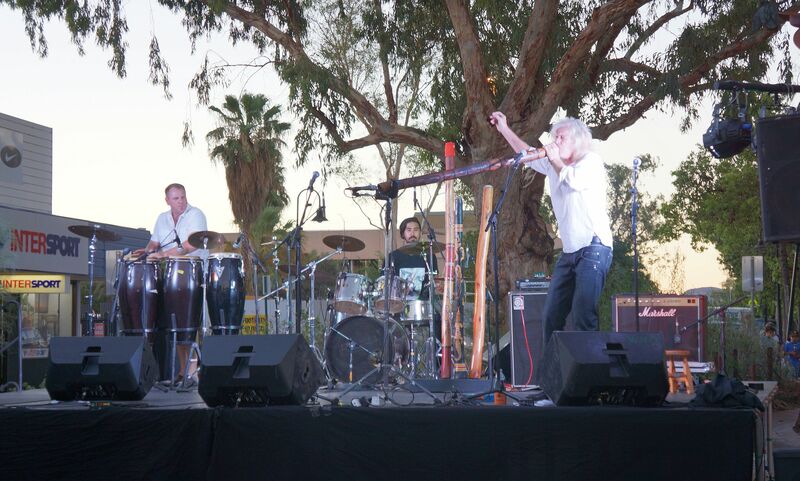 Our favorite band had two drummers and a man playing a didgeridoo. He had the output end of his instrument inches from a microphone, while he lovingly caressed the input end and played the most exciting music. An aboriginal man from the crowd began a sort of mixed style dance in the open area before the stage and the crowd applauded both efforts. 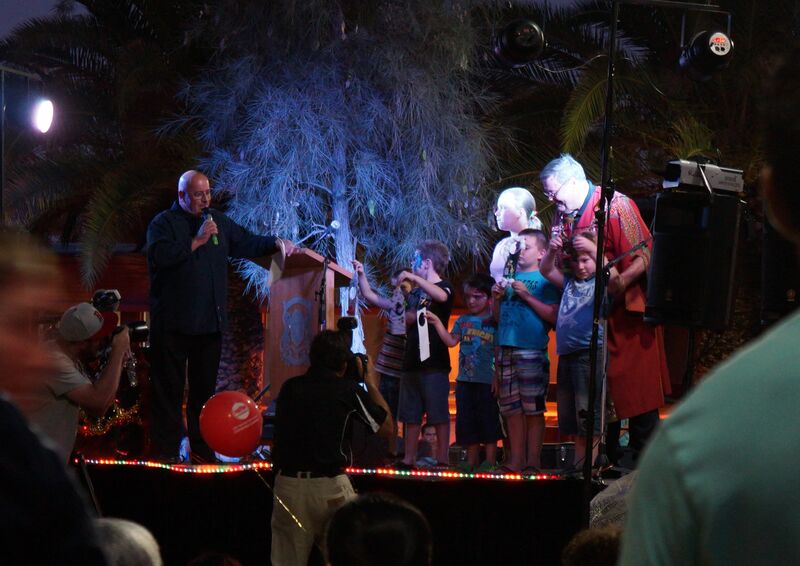 At 7:00 p.m., the mayor of Alice Springs presented prizes for the best decorated store window and also the best homemade Christmas ornament. 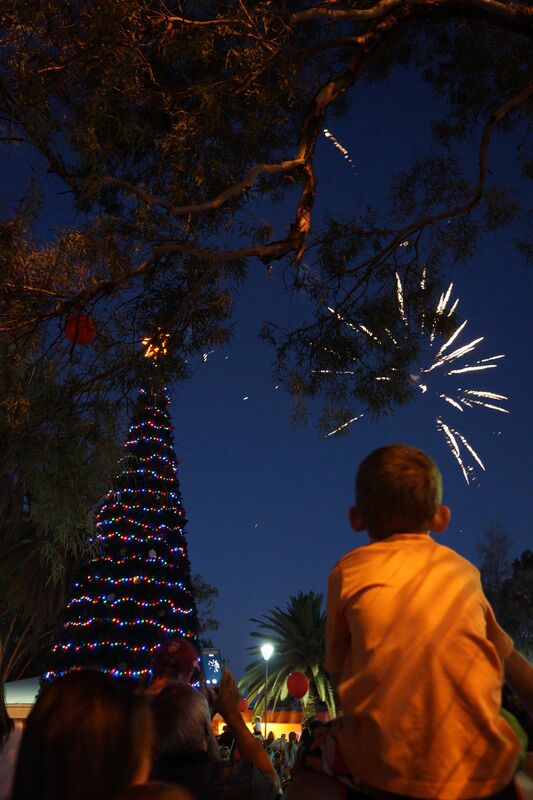 The latter competition was for the children and the winning child got to push the button that lit the Christmas tree in front of the courthouse. This action also signaled the beginning of a fireworks display, probably launched from the dry Todd river bed behind the court house. Altogether a very well organized and fun event. 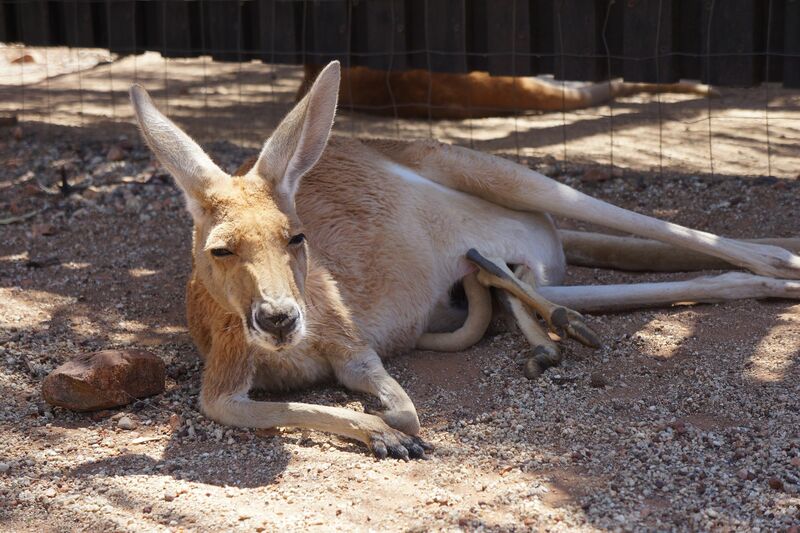 This morning we headed over to the Alice Springs Desert Park. 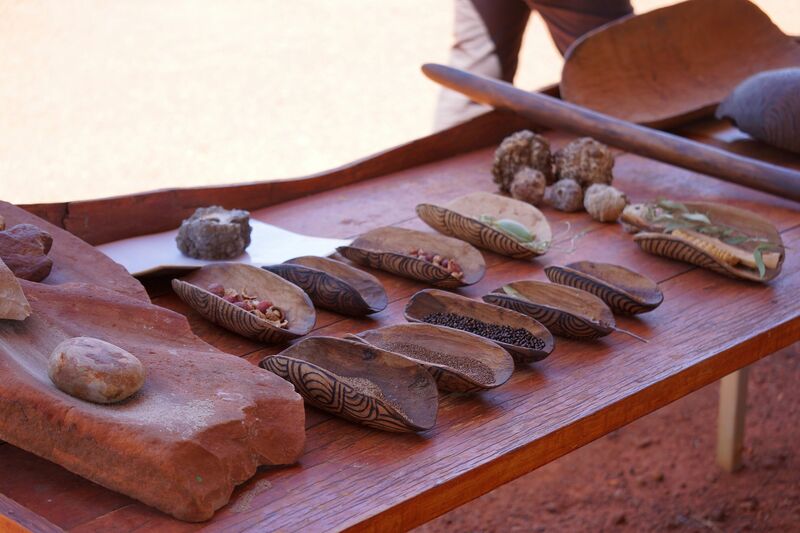 This is a sprawling park on the outskirts of town and specializes in displays of local fauna and Aboriginal culture. We began with a talk by an aboriginal park ranger on kangaroos in a paddock where a dozen or so red kangaroos were lazing about in the heat. He was partway through his talk when a couple of children ran up and began to poke the kangaroos. The latter immediately moved away, except for one animal that ran into a wire fence and began to thrash. The children did not recognize the danger that they were in and ignored instructions to move back, even as the ranger attempted to usher the terrified animal to safety. The talk pretty much ended at that point and I took the opportunity to quiz the man on aboriginal hunting techniques. He confirmed my surmise that historically, kangaroos were difficult for the native people to successfully hunt and were generally taken by ambush at a watering hole when they came to drink after sunset. The modern hunting technique is to take them with a head shot using a “22 Magnum” caliber rifle. The next exhibit was a lady talking about “bush tucker” and desert survival. I was interested that the base of the food gathered by the women was in the form of wild grass seeds that were milled using a suitably shaped grinding stone and that the resulting “flour” was made into loaves to be baked in the fire. This seems to be true of most hunter gatherer societies. The balance of the food was opportunistically gathered in the form of whatever was seasonal or could be found i.e bugs, lizards, roots, berries and the like. Her description of traditional social activities was straight out of “Clan of the Cave Bear” by Jean Auel. Now did our speaker get her spiel from the book, or is the book based upon Australian aboriginal culture? We had learned that when a culture is destroyed, as happened at Easter Island (Rapa Nui), the popular media version of history is substituted and becomes the “lost” culture. She began by explaining that in traditional aboriginal society, men and women are exactly equal – a feminists “dream”. Also there is no social hierarchy, no “pecking order”. She next stated that the senior men make all of the important decisions, determine who needs to be punished and then direct the appropriate punishment to be carried out by the younger men. Sounds equal to me. Our speaker showed us a map of Aboriginal languages and explained that most tribes were unable to communicate with the adjacent tribe. A hunting area might contain four or five extended families, each with one to three dozen members. The less available food density in an area, the larger the necessary hunting range. She was asked how the hunters knew the boundaries of their domain and she explained that it was the older females job to teach the young by the repetitious sand drawing of maps showing the water holes that could be used by their family and any landmarks. We had seen traditional sand drawings in the remote Cook Islands and elsewhere had been told that the beginnings of commercial aboriginal art was when these traditional sand diagrams were transferred to bark or canvas using the colored ochers and dot patterns of the traditional body paintings. Her claims to pre-contact longevity (80 to 90 years) was obviously nonsense and many hunter gatherer societies around the globe had a reported life expectancy of around 30 years. Wikipedia notes that the average life expectancy for a male, born in the UK between 1276 and 1300 (when there was both a census and written records made) was 31.3 years. We next visited the nocturnal animals exhibit which had the advantage of being climate controlled. Most native Australian animals are either nocturnal or crepuscular, the only major exception and motoring hazard I can think of being the Emu. This was a great exhibit with a variety of rare marsupials and reptiles. We saw a brown snake and were surprised to see that it was not particularly large and not particularly brown, yet responsible for the majority of Australian snakebite deaths. (The relevance of this observation came to us two days later – watch this space!). 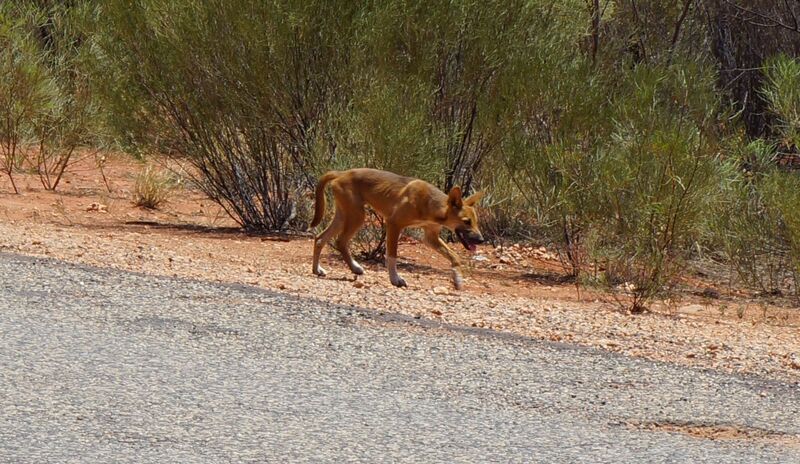 We headed out this morning for King’s Canyon, southbound on the Stuart Highway. There are short routes but all involve driving on gravel / dirt roads and when we had enquired at the information center, were told that a 4 wheel drive truck became a rescue candidate after the heavy rains the area has experienced. This is not for us. 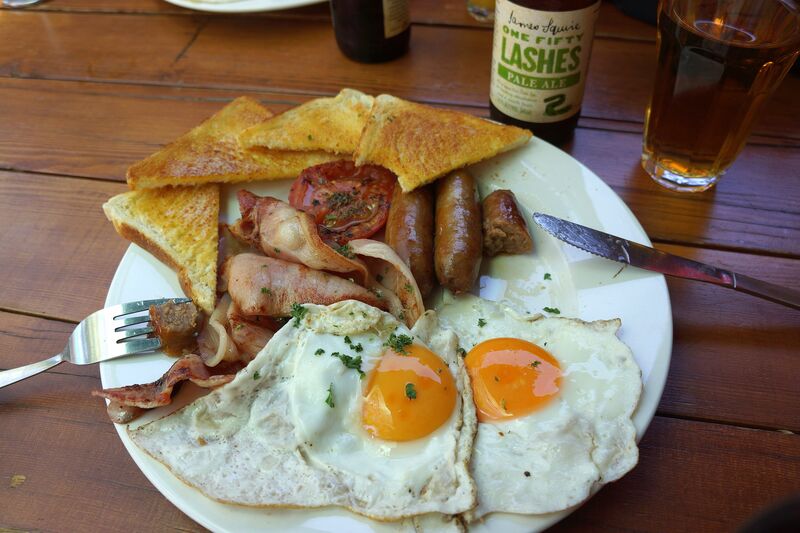 We took the long route and made our first stop at Stuart Well Roadhouse. We didn’t need fuel but Annette wanted to enquire about camels. 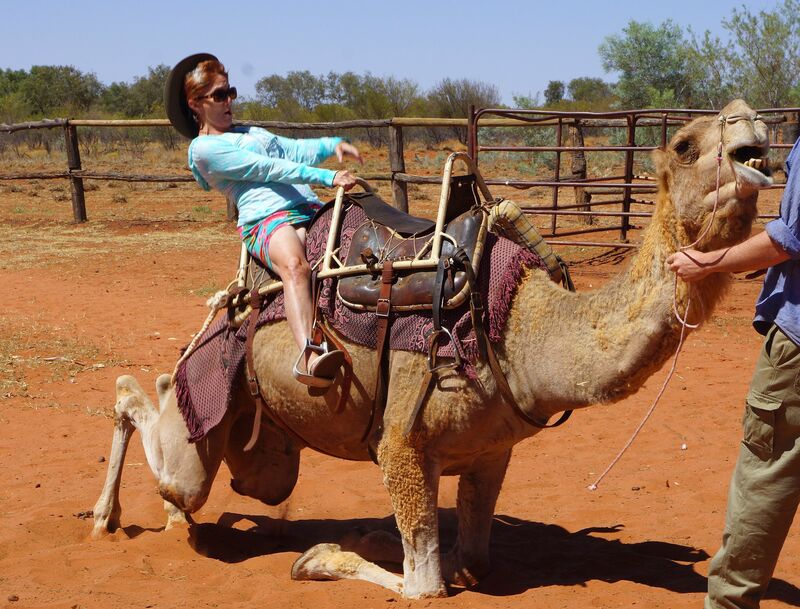 She emerged from the roadhouse with the news that they had a baby “Roo” in a pillowcase and that there was a camel farm next door. 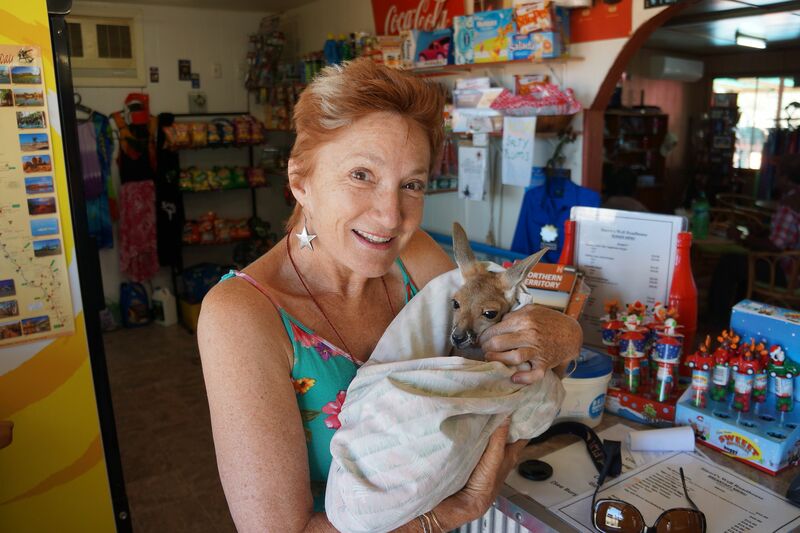 There was indeed a baby “Roo” in a pillowcase and Annette was allowed to hold and cuddle it whilst I took pictures. Its mother had been shot by Aborigines and for some reason, they dropped the Joey off at the roadhouse where the proprietors had been caring for the animal for the past two weeks. It wears a diaper when hopping around their house and Annette could barely bring herself to give it up. She was temporarily distracted by the camels next door and we watched the camel wrangler carry his coffee across the parking lot and then jump over the fence. 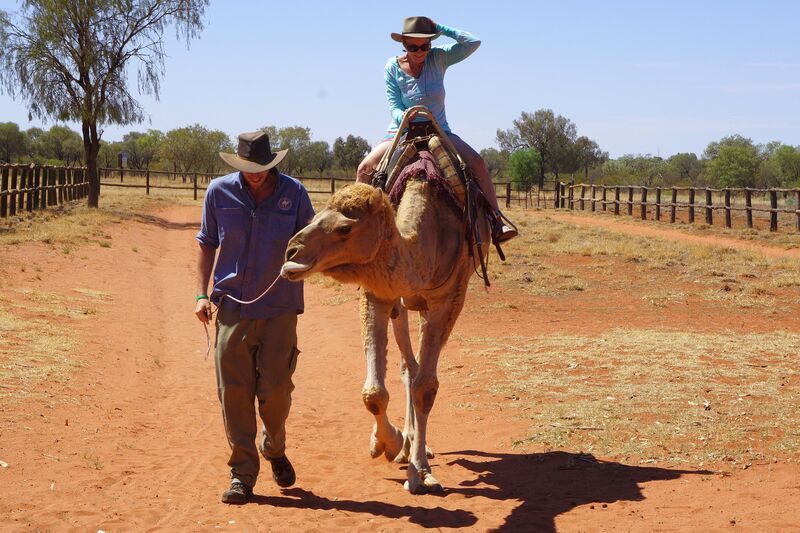 We went around the long way with the bus and Annette got to ride a camel around the paddock. We arrived perhaps a minute before another Toyota Coaster disgorged a full load of tourists on an “Outback Adventure”. While Annette was on her way to Akaba, I chatted with four of the new arrivals and found they were from Scotland, Japan, Austria and the Philippines. What an international mix! 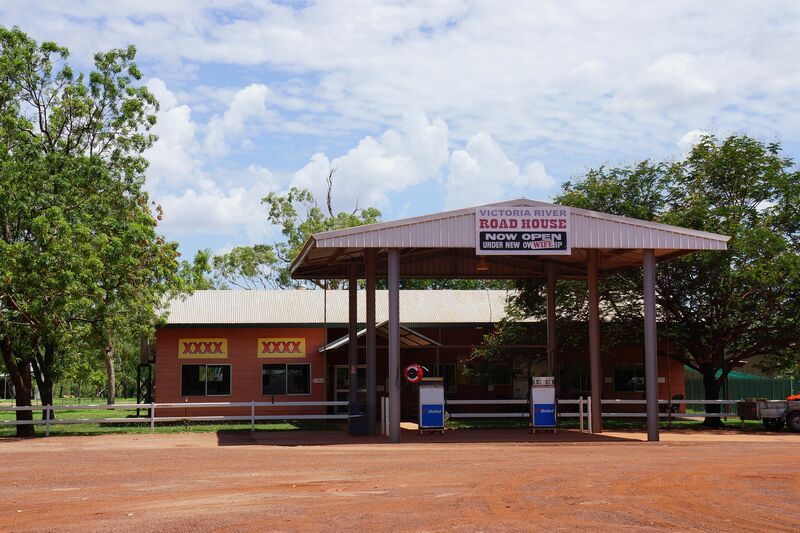 We continued south to the Eridunda Roadhouse and then left the Stuart Highway, heading west to the “Red Center of Australia”. 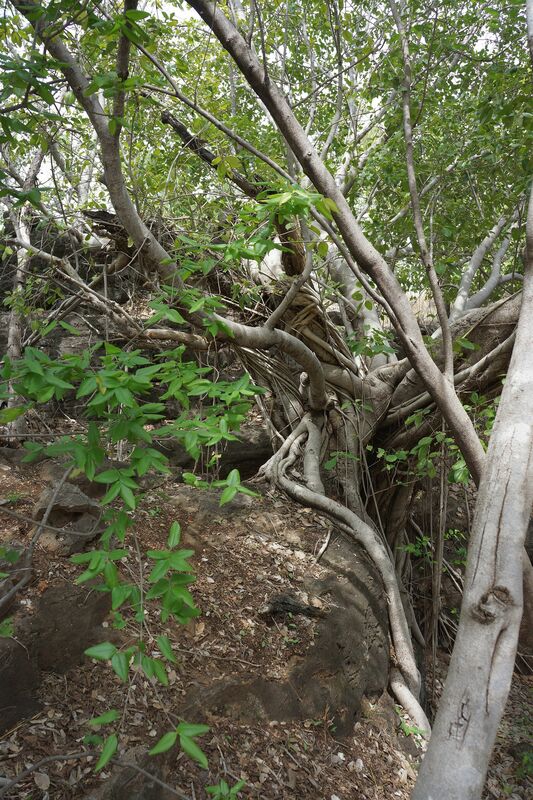 There were hills and escarpments, scattered vegetation and then an Acacia forest with broad spaces between the trees. A natural occurrence due to brush fires or artificially planted that way? At 60 mph. we never decided. Next the forest was gone and multiple dust devils were on the horizon. Off to our flank in the bush we saw six “brumbies” (wild horses) and a foal but nothing else, no road-kill kangaroos, emus or camels. Kings Canyon lies about 25 miles from our caravan park and it was just before 9:00 a.m. and already hot when we arrived at the park. The canyon is treed and shady along the creek side and we could see ahead of us, a group of hikers toiling up to the summit of the escarpment for a ridge-line walk. There were a couple of rangers who told us that we too could enjoy this exercise, as they were just about to “close the hike” due to the heat. We demurred and instead walked the creek bed into the canyon and found a quiet pool of water amongst the boulders at the head of the canyon. 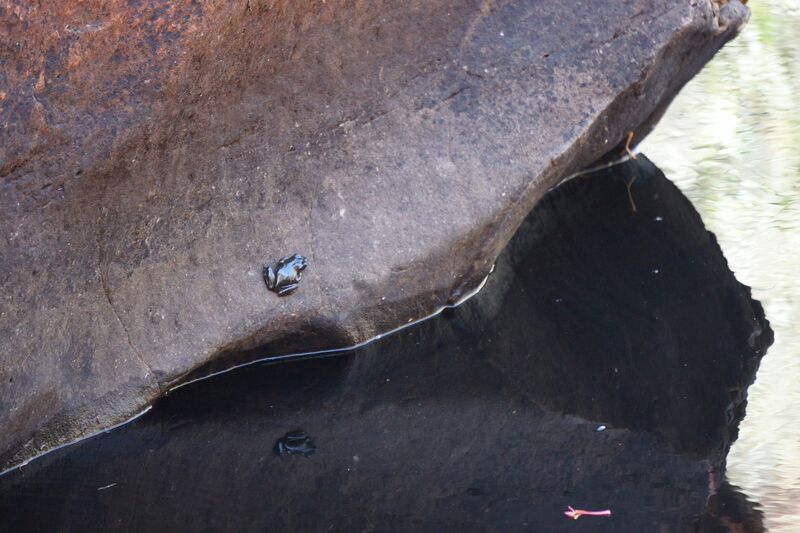 We spent a pleasant hour sitting on the cool rocks and watching the tadpoles and water scorpions (Laccotrephes spp.) play. 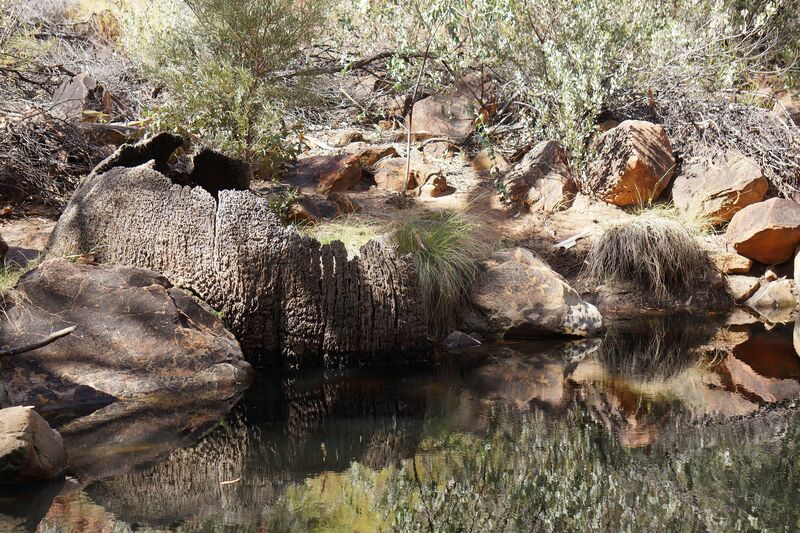 There were frogs clinging to the shadow side of boulders and a series of birds came to the waterhole to drink in the shade of the Eucalypts. 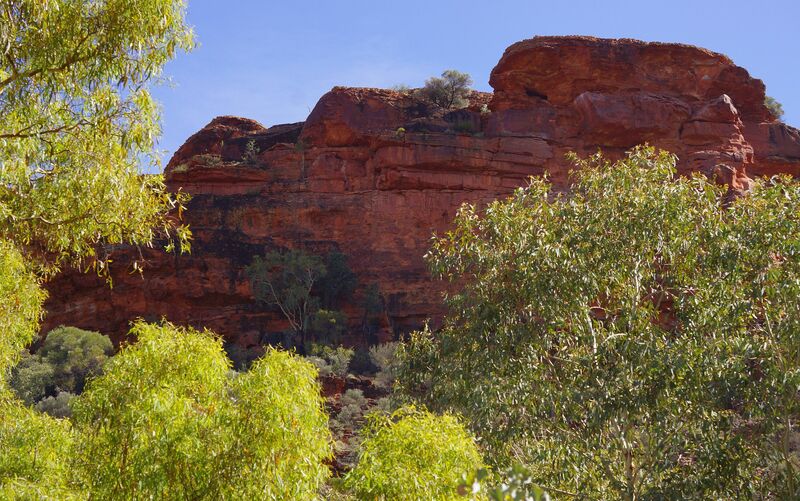 It was hard to tear ourselves away but the day was warming and we headed over to the Kings Canyon Resort for a very forgettable lunch. 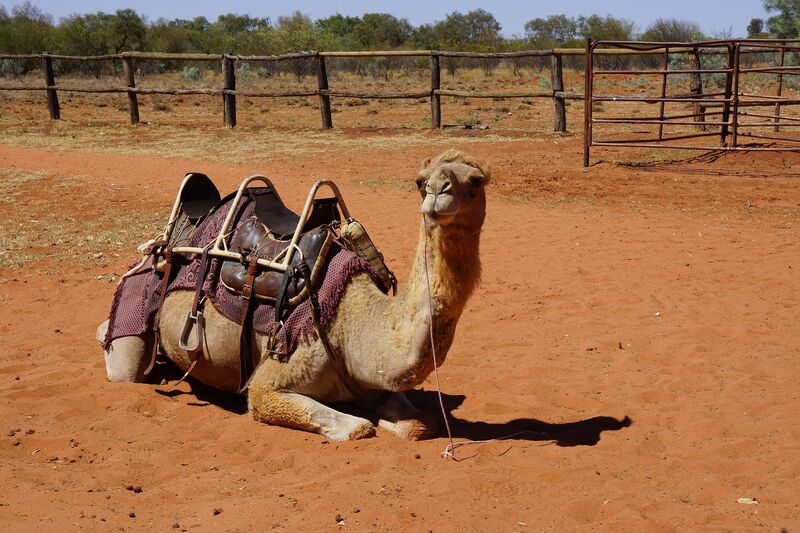 Back at the Kings Creek roadhouse we were told that there were a Baker’s dozen of camels in the “long paddock”. 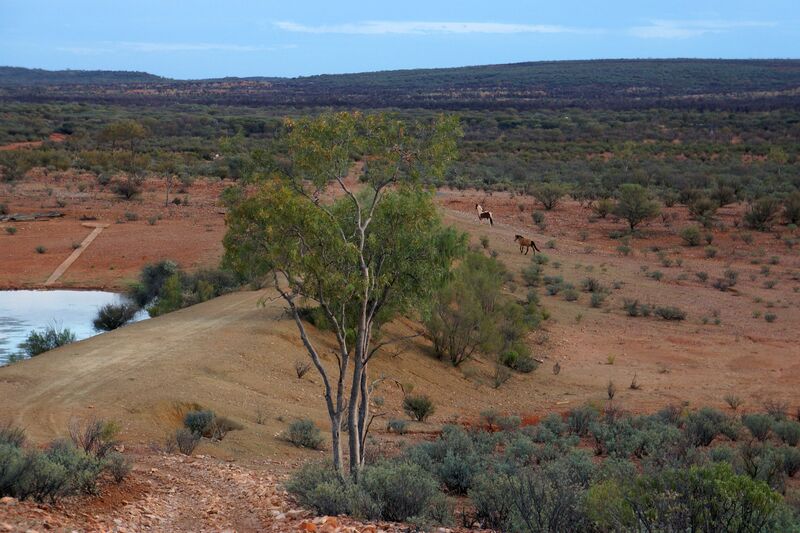 We walked the trail along the fence line, paralleling the highway and although we could see Brumbies on the opposite side of the highway, no camels! 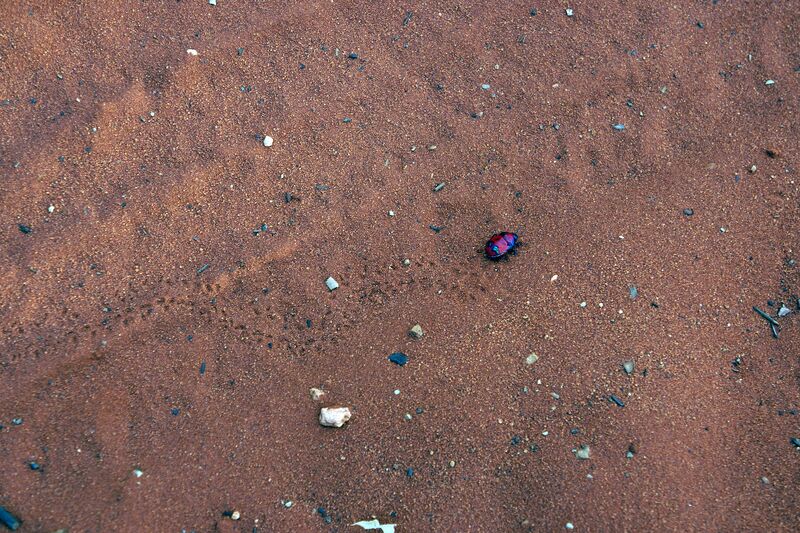 We walked on soft red sand, trying to find the firmer sections and analyzing the tracks we saw. One set of tracks was confidently determined to be beetle made, our confidence due to the beetle we could see making them but others looked to be mouse sized. At one point Annette poked at a worm looking thing with her toe, whilst I raved about Death Adders. Of course it couldn’t be a Death Adder because these bury themselves in the dust, right? Fortunately the “worm” turned out to be not the tail of one of the most venomous snakes in Australia but some kind of cloth covered, elastic hair band. About an hour before sunset as the evening was cooling, we walked to a lookout on a ridge top where the station has their water reservoir. 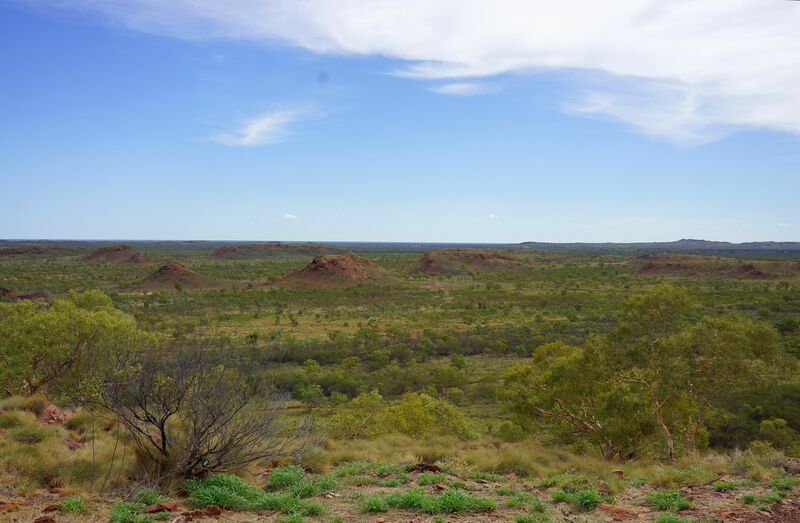 The scenery magnificent, the bush empty and devoid of life in all directions. Minutes after sunset, we heard the whinnying of wild horses and the lowing of cattle and from nowhere, they converged on the stock tank waterhole below us. The sunset painted the escarpment across the highway in flaming reds, the flies that had been plaguing us went home and we could remove the nets protecting our face and the temperature began to drop noticeably. It was near dark when we finally left the lookout and walked downhill to the caravan park down a track of soft sand. 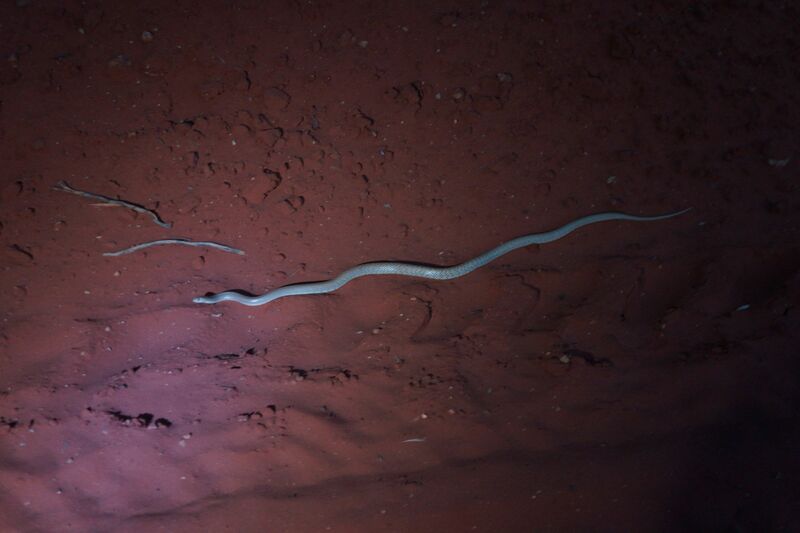 Annette froze at one point and turned on her flashlight to illuminate a brown snake, perhaps three feet away and heading downhill in our direction. Yes, it was just like the one we saw at the desert park in Alice, responsible for more snake bite deaths in Australia than any other specie. We took its picture.